I’ve always had a sweet tooth, but over the last couple of years I have developed a mini addiction to dark chocolate, albeit in smaller doses over my previous preference of the milk variety. I’ve explored many different flavour variations with dark chocolate, but one of my all time favourites is ginger with dark chocolate. I love the sweet, spicy, warmth that the ginger imparts in a good dark chocolate. As the festive season is upon us, I very much get into holiday baking/gifting mode. One of my favourite things to do around Christmas is to make personal gifts for people with flavours I think they may enjoy. It’s the perfect time for experimenting, sharing and giving a gift made with love. So far I have my a Christmas cake ready to be decorated, my mincemeat ready to make pies and numerous biscuits, cookies and crackers are ready for gifting. One thing I hadn’t attempted so far was anything chocolatey, which is unusual for me! 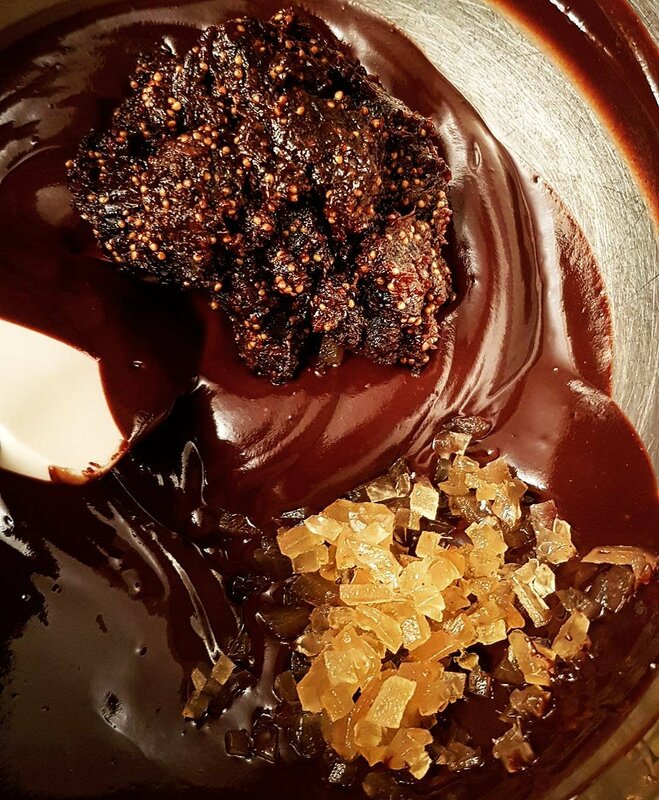 Last night whilst flicking through my new favourite Ottolenghi cookbook “Sweet” , I came across a truffle recipe that I’d had my eye on since I recieved the book. Alas, I had no pecans! But chocolate truffles were on my mind and there was a jar of stem ginger staring at me….so I started to look for ginger truffle recipes online. As is usually the case I wandered all over the Internet with many distractions along the way and ended up deciding that ginger was not enough. The bag of figs on the counter was going to find at least some of its way into my truffle concoction! 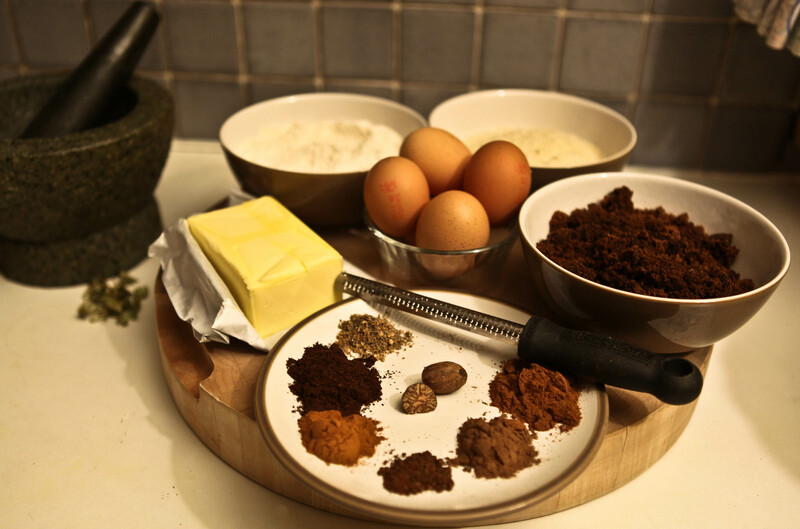 And so it came to fruition… Dark chocolate, ginger, fig truffles…. Sweetened with jaggery. A lot of different flavours… But trust me…. They all work so well together! The fig adds a texture and fruitiness that pleasingly complements the slight bitterness of the dark chocolate. The ginger adds a lovely sweet, spicy warmth and to bring it all together the jaggery embraces all those flavours and adds a distinctive but understated molasses sweetness that just makes this flavour combination perfectly festive. You can adjust the jaggery in this recipe to your taste. 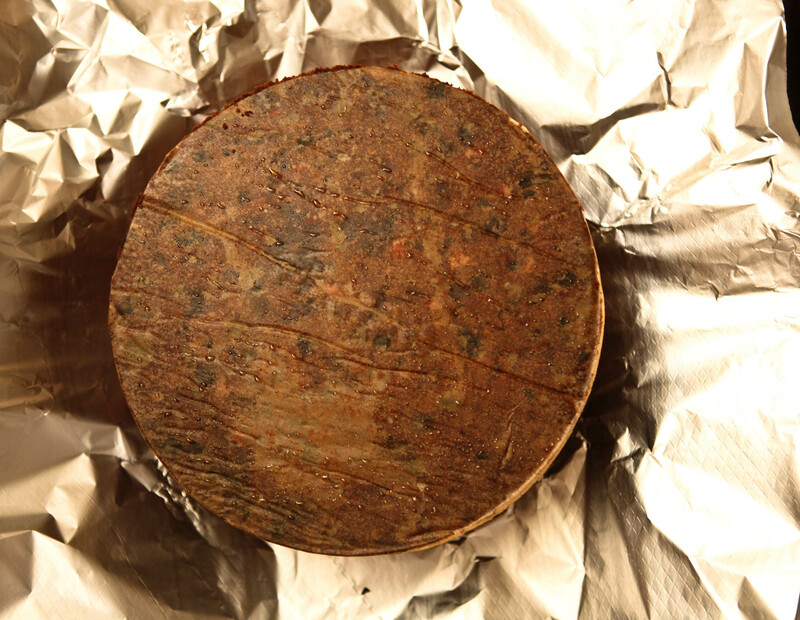 Jaggery in its pure form is unrefined sugar and so it has more flavour than sweetness. If you prefer a sweeter taste, you may add more jaggery or alternatively you can add some honey which would also complement the flavours, but give a slightly sweeter result. I made the ganache firmer than I usually would because I was going to coat my truffles in cocoa. This was mostly due to knowing I would not have enough chocolate to coat them all, but next time I would try these coated in chocolate. Either way I think the flavours are fabulous. Dark chocolate lovers… This is for you. 2-3 stems of ginger 35-50g (the one in syrup) chop these as finely as you can. I added 3, but I like ginger a lot so you can go according to your taste. 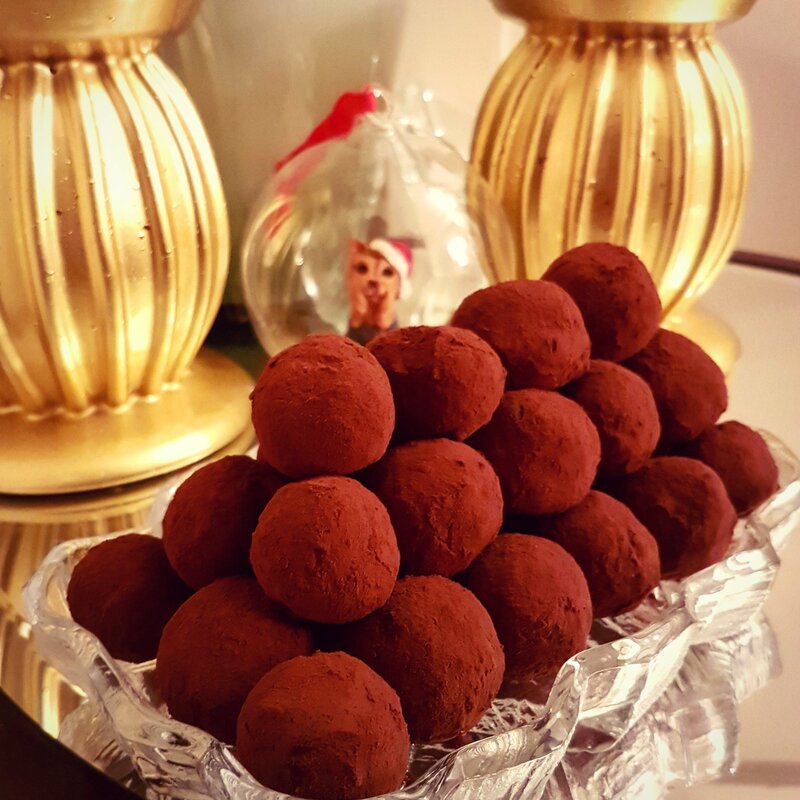 The great thing about truffles is that you can taste the ganache and add more flavour before it sets. I suggest adding less first as you can add flavour…but you cannot take it away! Good quality cocoa for dusting or about 250g dark chocolate for coating. First prepare the figs and ginger as directed above. 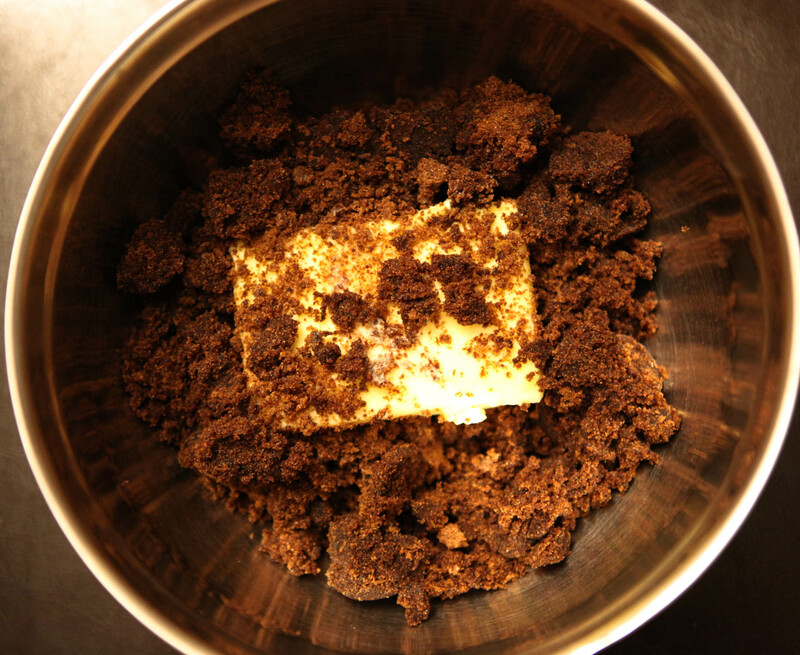 Next chop the chocolate finely and add to a heatproof bowl along with the ground ginger and vanilla powder. If you’re using extract add that to the cream instead as it’s liquid and may cause the ganache to split. Now take a small pan and heat the cream and the jaggery (and vanilla extract if using) bring to a boil and pour straight over the chocolate. Stir the cream and the chocolate until you get a glossy lump free ganache. Don’t stir to add air as this will cool it too quickly and it won’t allow for the chocolate and cream to emulsify properly. 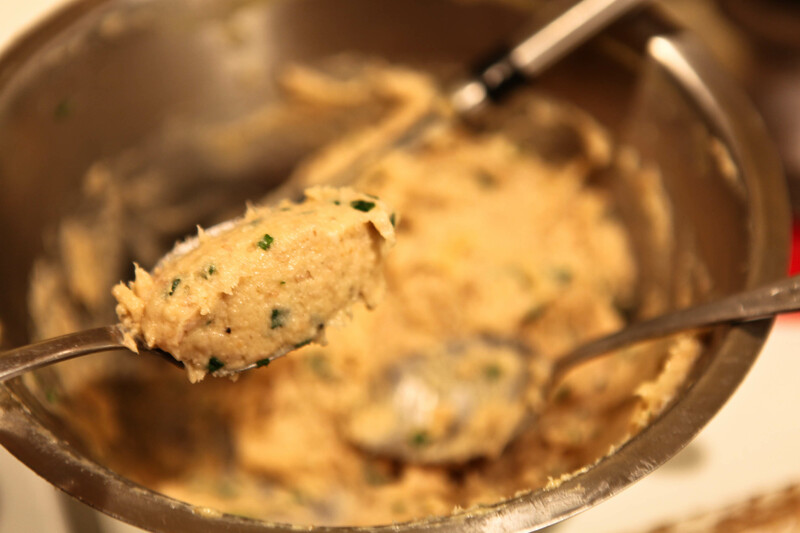 When you have a good emulsion add the butter and stir well to incorporate. Next stir in your figs and chopped ginger. Mix this in well and taste. Remember the flavours will develop as the mix sets, but at this stage you can adjust the sweetness with honey or add more ginger of you want a little most of a ginger hit… Either the chopped stem or the ground. Now leave the mix to set at room temperature overnight or if you want to make them quicker, leave for a couple of hours in the fridge. If you put the mix in thr fridge take it out 10 mins before rolling so thr bowl comes to room temperature. It will be easier to roll them. When you’re ready to roll them, take a teaspoon or a small cookie scoop to make the balls and either leave the balls in the fridge to set for 30 mins or roll them immediately in cocoa. These can be kept in the fridge for at least a couple of weeks and if it’s cold about 5 days on the counter. If you’re dipping them in chocolate, once dipped leave to set before putting them in the fridge. Although this blog has been dormant for some time, my passion and love for cooking have not faltered one bit! My desire to share my recipes and start this blog came shortly after my father passed away in 2009. It was a kind of therapy in a way and a connection to my father as we shared a love of good food and generous hospitality. Since I began the blog, much has changed and my culinary curiosities in other cusines have certainly widened and have immersed themselves within my day to day cooking. I have been cooking and baking for friends and family for years as well as enjoying doing this professionally in the past. Recently, I have been encouraged /badgered by friends to start sharing my cooking again via a supperclub. And so this in turn has triggered my desire to start blogging and sharing recipes again! The supperclub will be coming…. more information on that soon. I also have a new instagram account @amuseyobouchesupperclub so please do join me there for lots of recipe testing and deliciousness! In the meantime here is a Punjabi style roast chicken recipe that has been a family favourite, but this time I decided to stuff it and in this I discovered the brilliance of barberries in rice- a typically Persian way to utilise barberries. Oh and the way their sweet/sourness complements the tandoori chicken with the smokiness of the black cardamon in the rice is just perfect! You will have some leftover after stuffing the bird , but you will be happy for that and you can serve it with the meal as everyone will want more! First marinate the chicken. It’s best to do this overnight for the flavours to seep into the flesh of the chicken. 1. 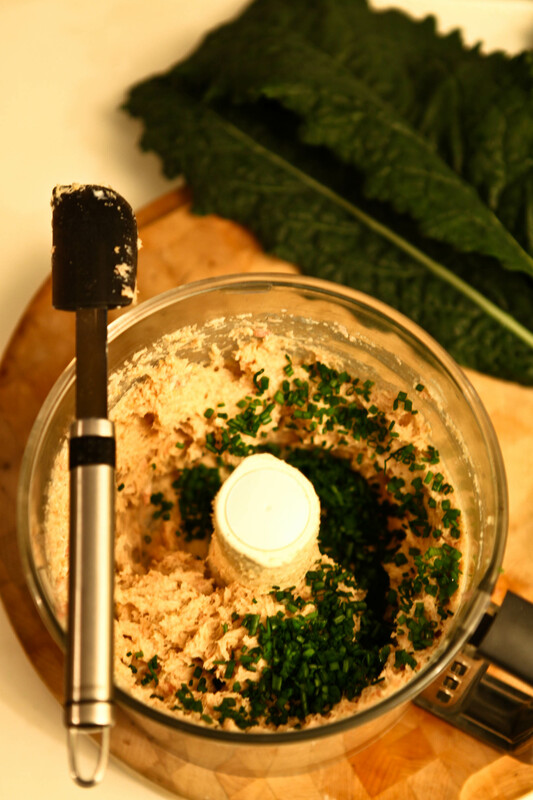 Take all the marination ingredients and put them into a food processor and blend to a paste. 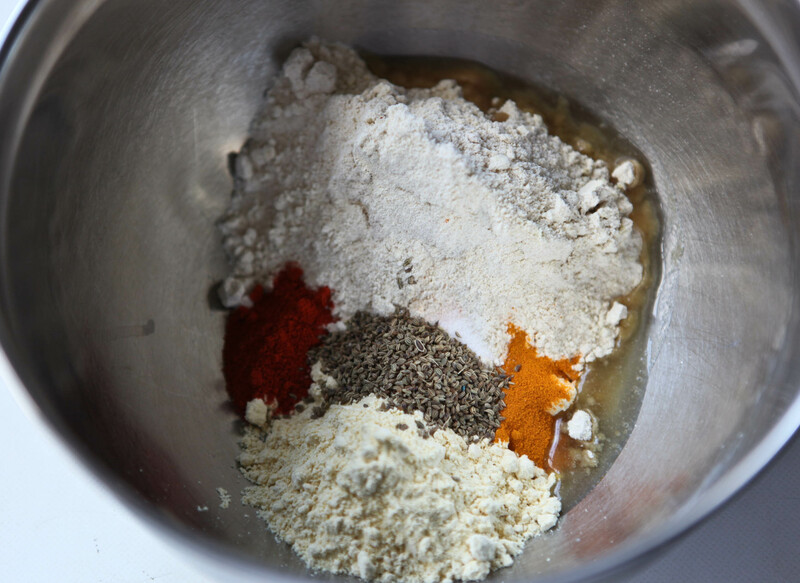 If you don’t have a food processor ensure the garlic, ginger and chillies are minced finely and mix them well with the rest of the ingredients in a bowl. 2. Stab the flesh of the chicken all over to allow for the marinade to seep into the meat. Then slather this thick marinade all over, inside and out of the chicken. Cover and leave to marinate in the fridge for at least 2 hrs, preferably overnight. You can make the rice in advance as it should be cool when you stuff the chicken. 1. In a pan heat 1 tbsp ghee and add the cumin seeds, black cardamon, bay leaf and cinnamon stick. Let the cumin pop and add the rice. Stir to coat the rice. 2. 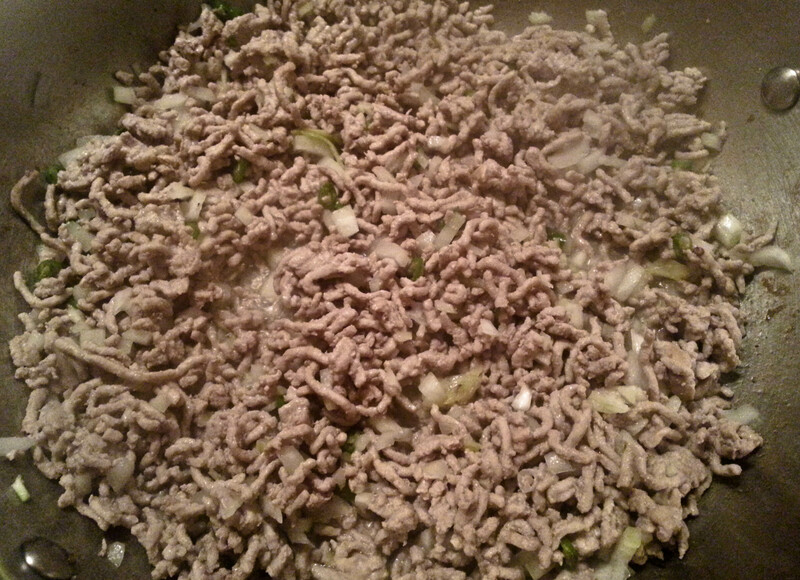 Add the fried onions, salt and water. Taste the water to check the salt. Bring to the boil, cover, turn the heat to the lowest setting and cook for 10-12 mins. You don’t want the rice to be overcooked. Firmer is better as it will absore more moisture from the chicken. 3. While the rice is cooking in another pan heat the remaining tbsp of ghee and on medium heat add the drained barberries and the sugar. Cook until they plump up. 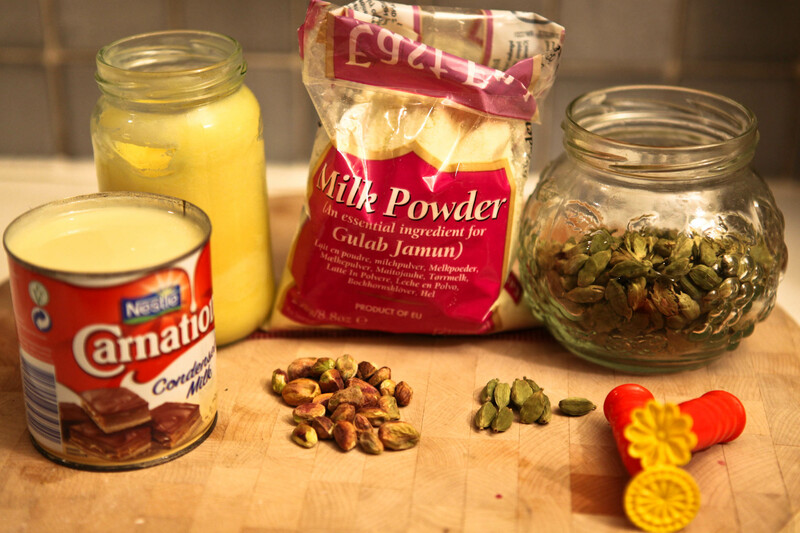 If you are adding the cashew nuts you can add them in now and turn off the heat. 4. 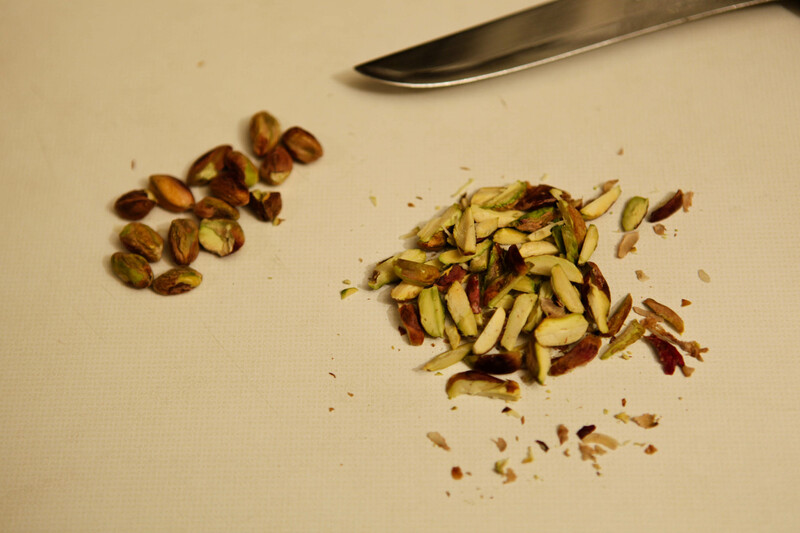 Once the rice is done, use a fork to separate the grains and fold in the barberry mixture to incorporate. Leave rice to cool. Once you’re ready to cook the chicken heat the oven to 160c. You will cook the chicken depending on the weight of the chicken. I usually cook it at the lower temperature for most of the required time, but for the last 15 mins I crank up the heat to the highest or put the grill on for 10 mins to create a tandoori bbq look. Take the chicken from the fridge and put it into a roasting pan. Carefully pack the cavity with the cooled rice, tied the legs together to keep the rice in (toothpicks also work! ), tuck the wings into the bird and baste the bird with the melted butter without agitating the marinade too much. I usually pour it over with a spoon. Put the chicken in the oven for the required time as I have mentioned above. When it’s done allow it to rest for 10 mins before serving. Serve with the remaining rice, and vegetables of your choice. Butter roasted potatoes with a sprinkle of cumin will make this a proper Sunday (or any day) roast. Check my Instagram feed for a delicious way to use up any left over tandoori chicken! Firstly, a belated happy new year! I hope 2013 has been treating you well so far. For me, it has been a good start although I have been putting off blogging since the holidays; so much to share, but I needed something to kick start me again and that happened earlier this week. The absence of posts is mostly due to the lack of time to experiment since the holidays. Although, I do have a couple of noteworthy holiday recipes to share at some point. Maybe I will save them for later in the year as they aren’t so season appropriate right now! There has however been some cooking happening and for the most part it has been with a more health conscious focus in mind. 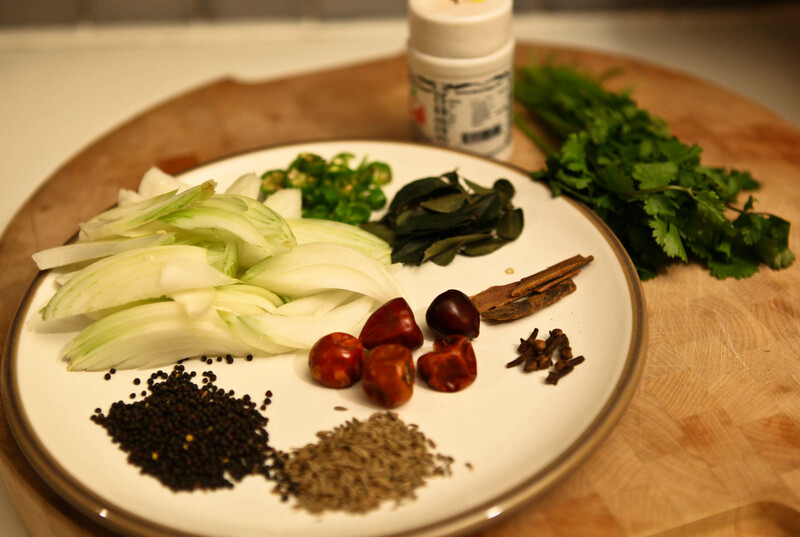 Chinese is one of my favourite cuisines to eat out and the recipe I am sharing is inspired by a very popular Chinese Sichuan dish; a dish I had not tried until a couple of years ago. I was surprised that all these years I had missed this because it is absolutely delicious! Of course, now I order it almost anywhere new I try just to taste the differences and let me tell you there are many! 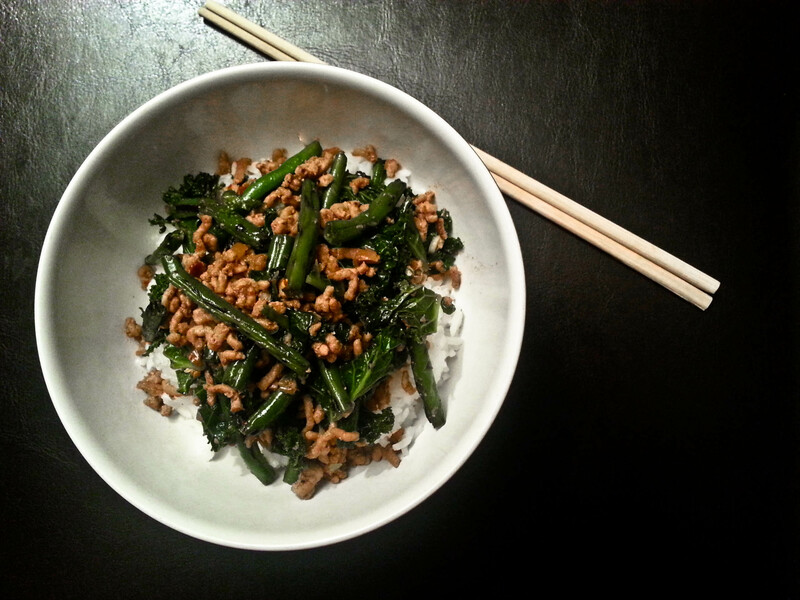 My favourite version of this dry fried green bean dish is when it has pork in it too. What I love about this recipe is that it is delicious to eat on its own if you are omitting carbs in the new year, for example. As well as having a much higher ratio of vegetables to meat than other dishes, it is healthier too. If you use lean mince and the oil a little more sparingly you will still have a dish packed with flavour, texture and lots of deliciousness! One of my favourite quick weekday dishes. In the past I have also cooked this with duck breast fillets chopped up to a course mince consistency with excellent results. I also add a little more 5 spice powder and sugar when cooking the duck version. This is a delicious alternative to the pork. Check seasoning at the end- you may add a little more soy or salt. Heat a large wide based pan. Drizzle over 1 tsp of oil over the chopped beans and toss before putting into the hot pan. You just want a light coating on the beans as your aim is to dry fry the beans at a high temperature to retain some texture and colour. Some recipes suggest deep frying the beans, but apart from adding a lot of calories, having tried it, I found I much preferred the fresher taste when just a little oil was used. Cook the beans at a high temperature, tossing them regularly for about 5 mins until they have evenly blistered and soften slightly. When done remove from the pan. In the same pan add a couple of tbsp of the oil you are using and add the pork. Fry until you get some colour for a couple of minutes. Next add the onions and green chilies. This is something extra I have added in my version. I like the sweetness from the onion and the flavour of the green chili. 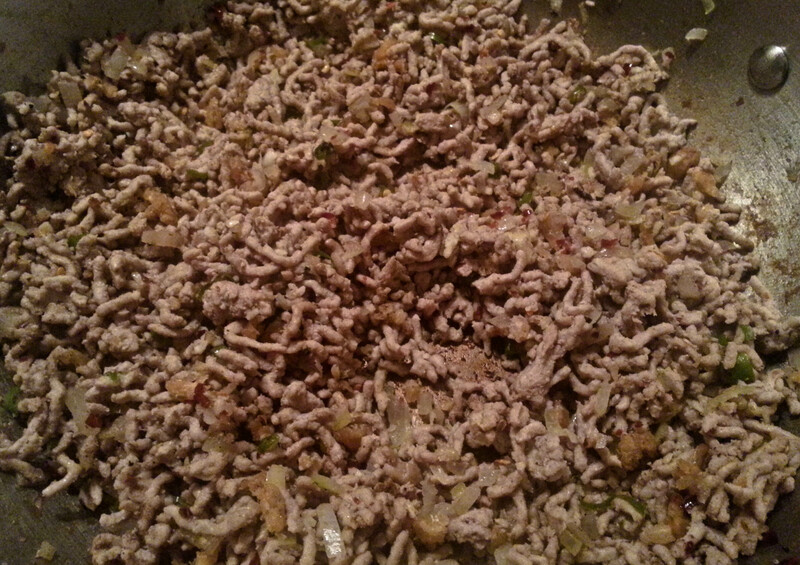 Fry with the meat until the onions are translucent and have softened. 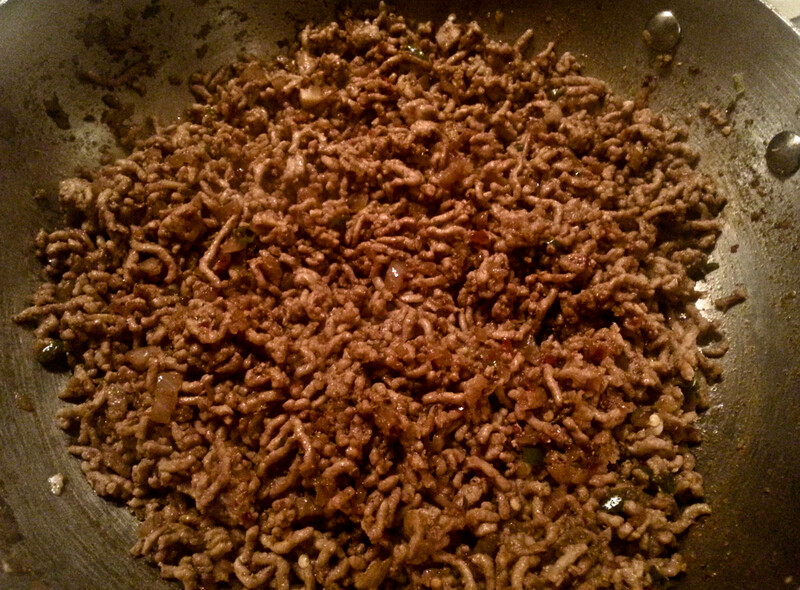 Now lower the heat and add in the finely pressed garlic and chopped dried shrimp. If you can’t find the dried shrimp you can just omit it. There really isn’t a substitute You could try to find a chili oil that is made with shrimp paste and omit the red chilies and use that instead. The dried shrimp are usually in the refrigerated section in a Asian supermarket. They come in different sizes, but for this dish any small ones will do. Fry for a minute or two. Now you can turn the heat back up and add the liquids and spices- the 5 spice powder, the sugar the Sichuan peppercorns, the red chili flakes, the soy sauce, the rice vinegar, toasted sesame oil and the Shaoxing wine. Stir well as the liquid evaporates. Once it has evaporated check for seasoning. Remember that the beans and kale have no seasoning so you need to add a little extra. 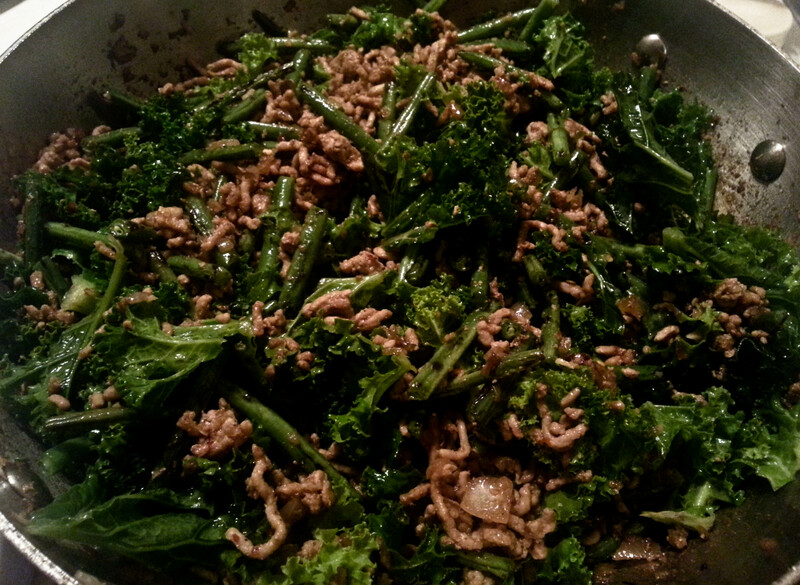 Finally add the beans back in with the kale leaves (stalks removed) and stir well. You do not need to cook it much- 1-2 mins. You just want the beans warmed again and the kale to wilt slightly. Check seasoning. Take off the heat and garnish with spring onions. You can serve this with steamed Jasmine rice for a hearty meal. With just under a month remaining; fear not, it’s not too late to make a homemade Christmas cake, in fact this recipe has been tried and tested up to a week before Christmas and it has been just as delicious! I have not always been a fan of this deeply rich boozy, buttery cake, jeweled nay, brimming with plump intoxicated fruit and nuts. As a child I loved my little packs of Sun Maid raisins, but bring me a slice of this “adult” cake laden with one of my favourite break time snacks and you’d see me turn my nose up at it quite promptly. As with many things, my tastes have evolved with age and I now look forward to baking my own boozy Christmas cake and mince pies every year. My mother particularly loves fruit cakes and so we would have them in the house now and then. She liked them so much that she would attempt making them when her cravings demanded it and as no one else liked them, she would eat the entire cake alone- of course, over several days! I remember my tastes changing around Christmas at 16 or so. Instead of cooking at home for Christmas, we decided to eat out. As with any Christmas lunch there are 4 or 5 courses…sometimes more. The hotel that we were eating at was renowned for it’s restaurant and so we were sure to get a delicious Christmas feast. Having an undeniable sweet tooth, I remember working my way down the menu dreading to find that the only desserts available would be boozy, fruit based ones. What I disliked more than Christmas cake, was Christmas pudding. Stodgy, boozy and fruity. Not appetizing or appealing to me at all. To my relief there were a number of other acceptable choices. I can’t remember exactly what I chose, but I am sure it was something chocolatey. I also noticed that one of the courses on the menu was “Mince Pies and Port” with no alternative; more for Mum, I thought. After we had eaten the most deliciously perfect turkey with all the trimmings, along came the mince pies. The waitress placed a plate of deceptively delicious looking pies in the centre of the table so we could all help ourselves. My mother loves mince pies too, and so I remember us all joking that she would be the one eating the entire plate. My father took one because he loved pastry and so as usual my sister and I copied him and did the same. He neatly left the filling behind as he enjoyed the pastry and the port. As I nibbled away at the pastry I remember the taste of the filling that was clinging to the inside of the pastry. It’s aromatic, syrupy sweetness and hint of citrus and spice was DELICIOUS! I slowly but surely ate the entire pie, filling and all. It was a seriously delicious mince pie. Yes it was boozy and full of fruit and nuts, but I loved it. Ever since that day my interest in boozy fruit and nut filled sweets began! The recipe I am sharing is the one that I have adapted from probably 4 or 5 recipes that I have tried over the years and now this is the one I make every year. Although the content of it varies from year to year, the base and measurements stay the same. 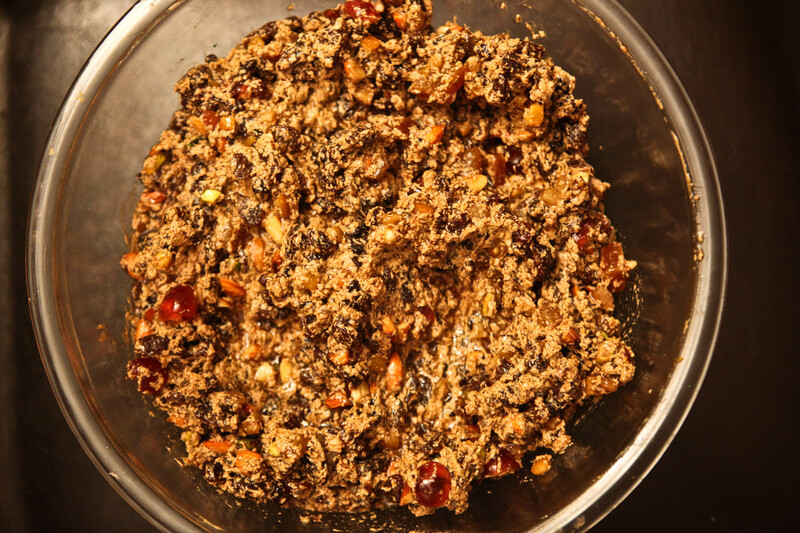 A month is more than enough time to make a deliciously boozy mature and moist Christmas cake, and in fact if you are extremely last-minute, you can make this even a week before as I have done in the past. It will be slightly less boozy, but equally moist and delicious. 1kg of mixed fruit I vary this every year. 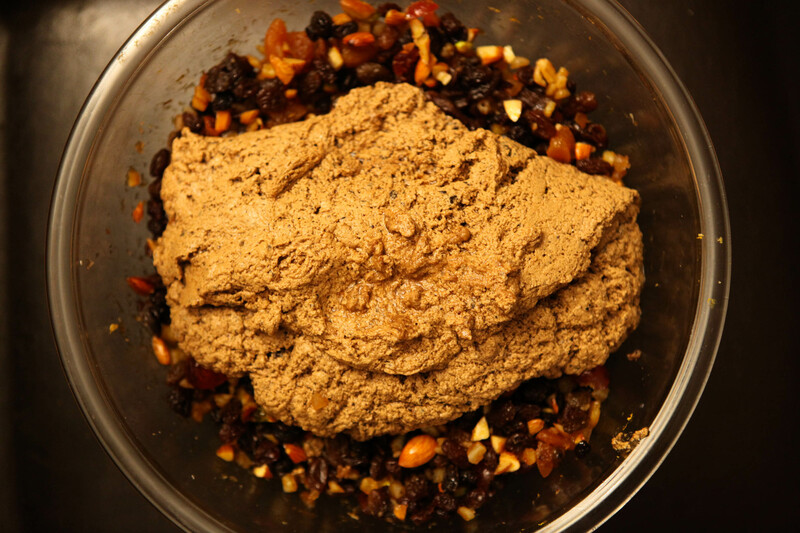 A good starting mix would be 250g currants, 150g sultanas, 150g raisins,(550g of ready mixed vine fruits will suffice), 150g glace cherries, 150g dried apricots, 150g italian mixed peel. 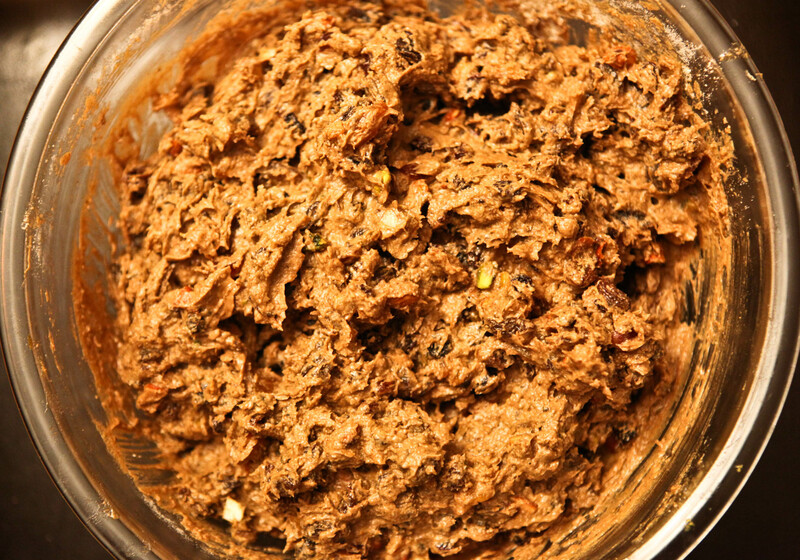 You can vary this with this cranberries, figs, prunes, dates, etc. 125g roughly chopped almonds. You can used blanched almond without skins, but I leave the skins on. I also vary this with a mix of nuts. This year I used 75g almonds and 50g pistachios. 150mls of soaking liquour I usually use a mix of brandy with 2-3 tbsp of amaretto to make up the 150mls. You can use whisky or rum as well. 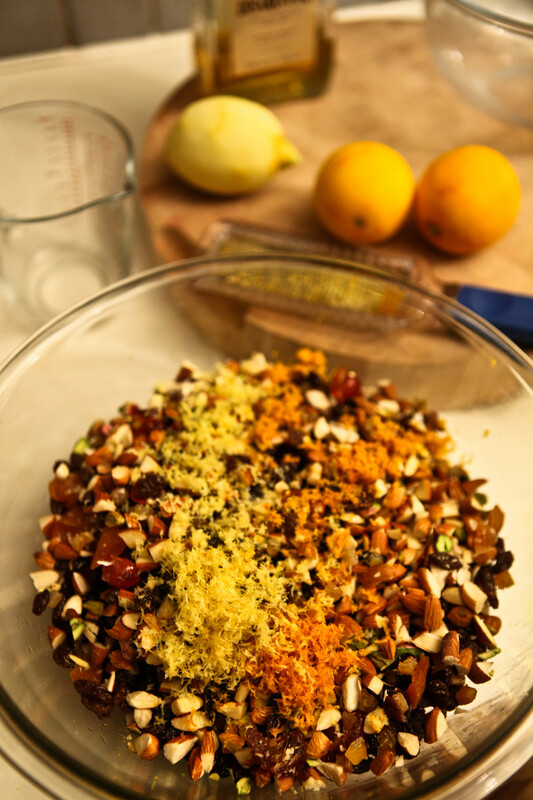 Take a large glass bowl (I prefer glass as it is non reactive) and tip in all the fruit, nuts, zest of lemon and oranges and mix well. Finally add the booze and stir to coat all fruit. Put a lid or plate on top and leave to macerate overnight so that the fruits can soak up all that lovely booze. 275g dark muscovado sugar (if you want to try a deeper richer flavour try molasses sugar, likewise if you want a lighter flavour, use light muscovado sugar- or a mix. Spices: 2 tsp mixed spice, 1 tsp allspice, 1/4 tsp ground cloves, 1 tsp cinnamon, 1 tsp ground cardamon (for the Indian in me! 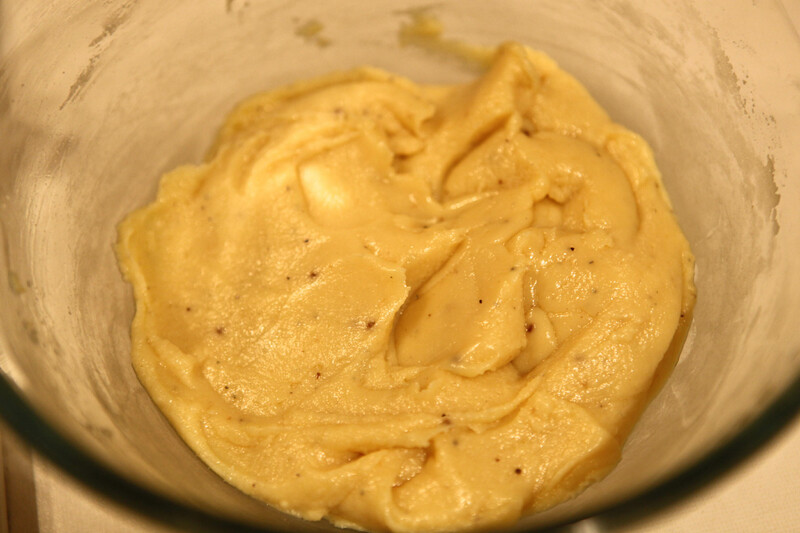 ), 1 tsp ground nutmeg, 2 tsp ground vanilla beans (if you cannot find use 1-2 tbsp good vanilla extract.) You can vary these spices according to your preference. A couple of extra tbsp of the liquor you are using for good measure. This is entirely optional. I just enjoy the spirit of adding more spirit…no pun intended. You will also need some newspaper and string, a deep 9 inch cake tin (preferably loose bottomed), baking parchment, a large roasting tin that will fit your cake tin, oil or butter for greasing and your regular cake making utensils. Preheat the oven to 140C no fan. I don’t use a fan oven to ensure that the cake doesn’t dry out. 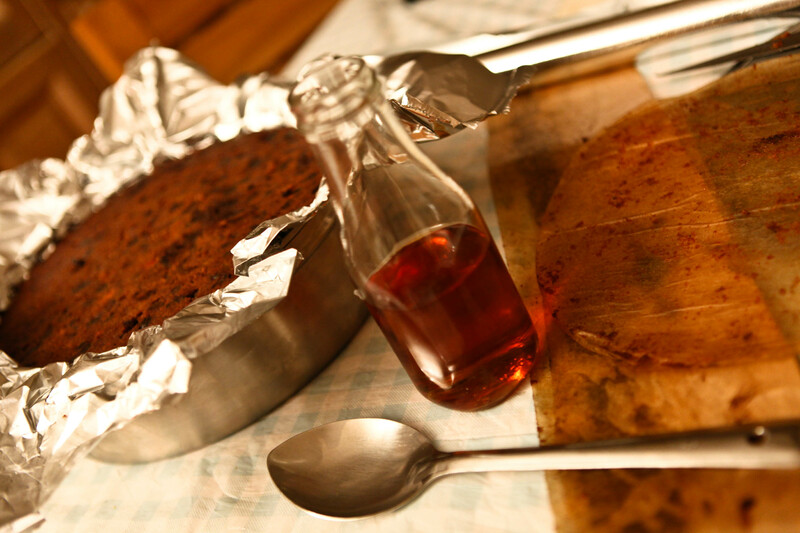 Prepare the tin first by greasing and lining it with baking parchment. Ensure the paper that you line around the side of the tin is taller by an inch or so for a collar. When you make the circle for the bottom, triple up your paper to make 3 circles as you will need 2 circles to place over the cake with while it bakes to protect it from burning. 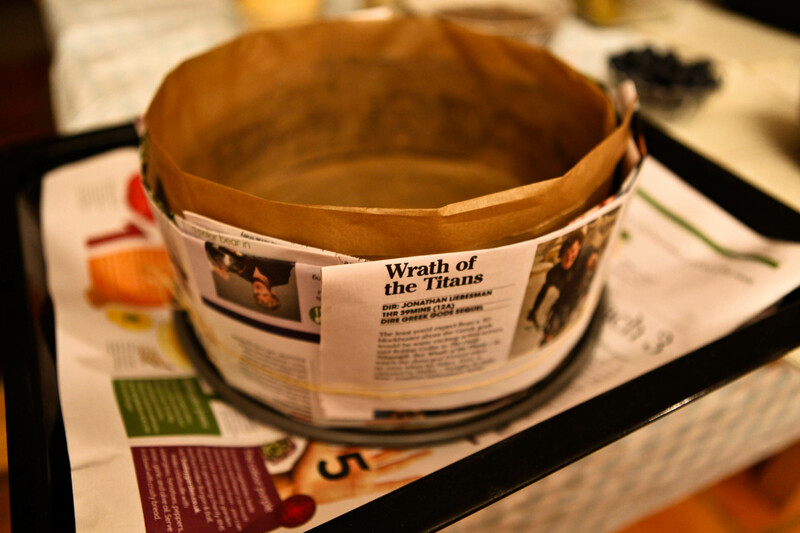 Take your roasting tin and line it with 3 or 4 folded sheets of newspaper. Then take 4 sheets and fold to a width that will ensure a 1-2 inch collar above the rim of the cake tin. Take some string or thread and tie it securely. Next take the butter and the sugar and cream well until light and fluffy. Add the eggs one at a time beating well each time to incorporate. The mixture may curdle, but this is fine. Add the vanilla extract and extra tbsps of liqour now if using and mix. 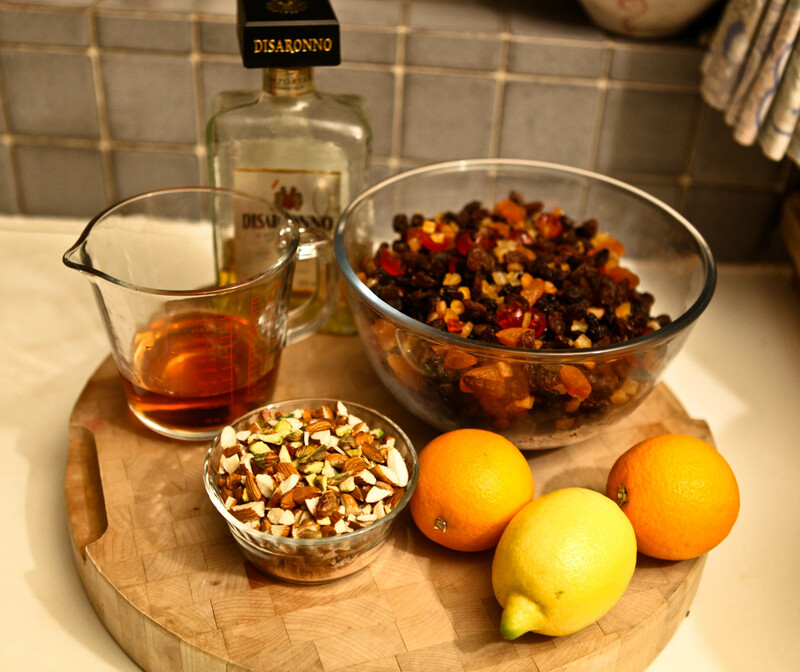 Now add this mixture to all the fruit and nuts that you have soaked and stir well to coat. Instead of sieving the flour I take all the dry ingredients- the flour, baking powder. 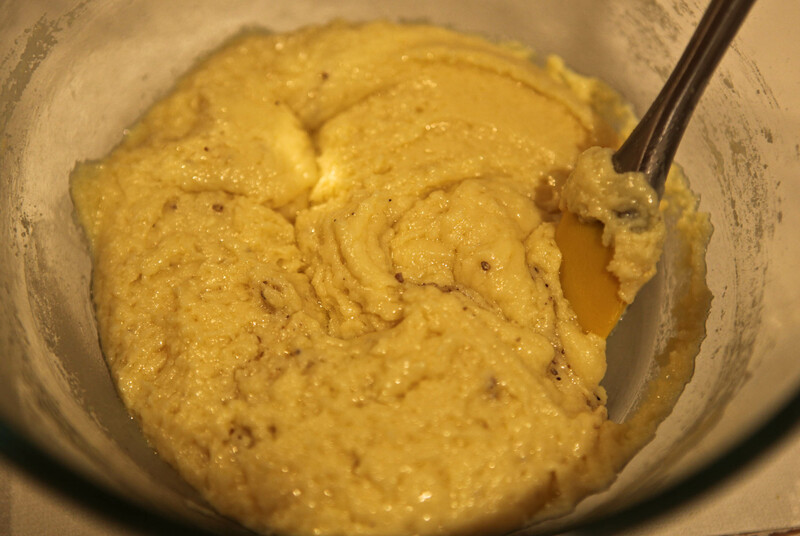 ground almonds and spices and whisk them in a large bowl to lighten them and add air. 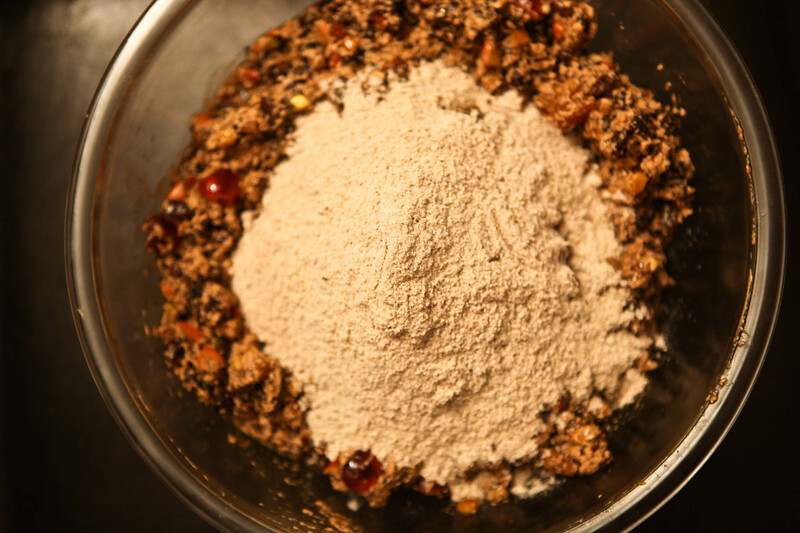 Take the dry mixture and fold into the wet mixture in two lots until all is incorporated. The consistency is a soft dropping consistency. Less soft than a victoria sponge because of the body of the fruit, more the texture of ripe bananas when you mash them. Spoon the mixture into the greased pan, spreading to level the surface. Take the two other circles that you cut our earlier and snipe a hole in them about the size of a 5p/dime coin and gently place over the top of the cake batter ensuring you don’t press it down too much. Place the cake in the middle of the oven to bake for about 2 – 3 hrs. Every oven is different so please check after 2 hrs inserting a skewer in the hole you created in the centre of the top layers of baking parchment. Mine was done in 2 hrs 15 mins this time, but it has taken longer before. The cake is done when your skewer is clean. Leave the cake to cool for some hours and then remove from tin. Remove baking parchment around the sides and the top of the cake. The top of the cake is unlikely to be completely flat and so a tip I have here to ensure a nice even flat surface to decorate on is to use the bottom of the cake as the top. Place a large sheet of strong turkey foil over the top of the cake. Then place a large plate over this. Now flip the cake over so the top now becomes the bottom. You will now have a lovely smooth flat surface to work with. 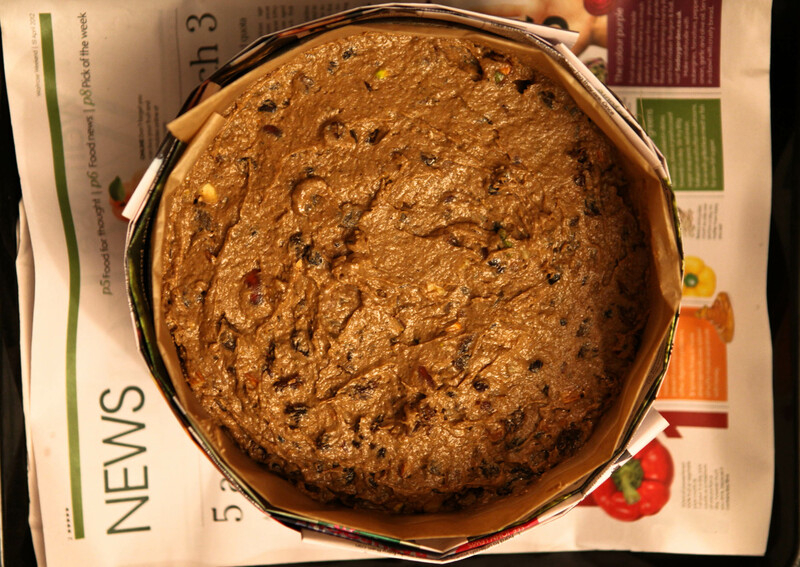 Lift the cake using the edges of the foil and place into an airtight tin. If you don’t have a tin big enough, you will need to wrap it 2 or 3 times in foil each time you feed it. The liquour of your choice. I mostly make a mix of brandy and amaretto 2:1 and feed the cake with this every 4 or 5 days depending on how long it is before I intend to serve it. You can also use rum, whisky or sherry. After you have baked the cake and it has cooled, before closing the container and wrapping the top of the cake take a skewer and poke holes evenly all over the cake. Take your liquor and spoon 5 -8 tbsp over the top ensuring that it is all absorbed before you wrap it up again. Repeat this process every 4- 7 days depending on how long you have before you are serving it. I don’t like to decorate the entire cake as I don’t like too much icing, so I usually cut out a round of good quality marzipan and white fondant and place on top of the cake before decorating with something Christmassy and wrapping it in a festive wide ribbon. 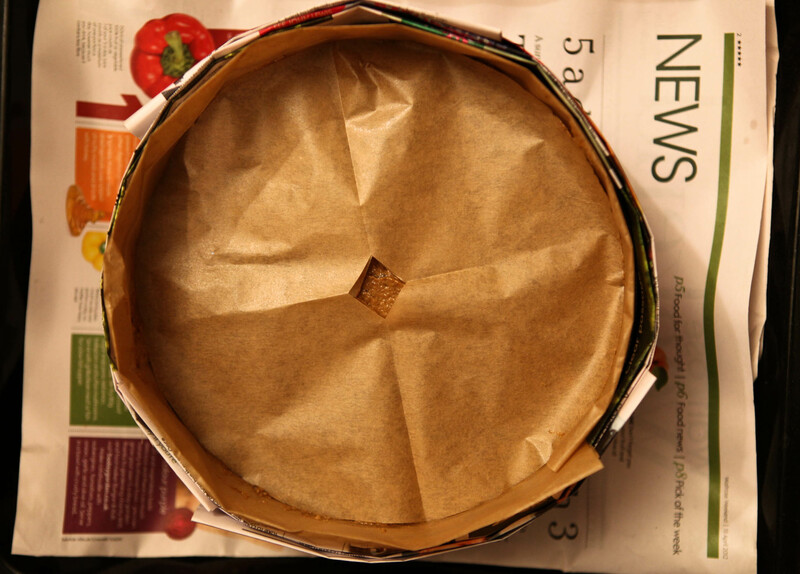 Roll out the marzipan to 3-4mm and cut out a circle out by using the cake tin for size. Attach by brushing the cake with either apricot jam or some more liquor. Leave this to dry for a day. The next day cut the circle for the white fondant and brush the marzipan lightly with liquor before placing the fondant on top. Leave to dry for a few hours or overnight before decorating depending on what you are planning to do. You can wrap the cake with ribbon whether you ice the entire cake or not. Be sure to come back and check my decorating post in a couple of weeks for some tips on how to decorate your cake! Diwali is one of my favourite times of the year. For me it marks the official change from Autumn to Winter. Reminding me that Christmas is only around the corner. And so the festive spirit embeds itself inside me for the coming months. I am not an overly religious person, but for me, Diwali has always signified a much stronger sense of letting go and cleansing of the year that has passed than the New Year that is followed by western tradition. This feeling stems from memories as a child. The togetherness I have felt as a family during Diwali over say Christmas or New Year has always been much more meaningful. This is more than likely due to the ritual we follow that makes me feel like we’re cleaning out the old to invite and make space for the new. Diwali has always been something that was important that we celebrated between the 4 of us. An intimate celebration. I remember being excited about the fact that Dad would be home from work early that day because pooja (prayers) would have to be done around 6pm bringing dozens of fireworks with him. Meanwhile, we would light up the house. The soft, glimmering candle light from at least 50 candles scattered in every room pervaded the house. We made certain all the curtains were wide open to ensure that Laxami (the goddess worshiped during Diwali) would find our house as it would be shining so brightly in the night sky. When she found us she would bestow us with love, prosperity, health, wealth and happiness for the coming year. The first thing we would do when Dad came home was the pooja that was conducted by Mum and was finished by Dad who blessed us and then started the exchange of prasad (sweet offering during prayers) between each of us that we all took turns giving each other. With the Laxami Aarti (song sung in praise of Laxami) chiming softly in the background, we all would sit to have dinner. It was always a simple, but astoundingly delicious dinner made even more so by the peace and togetherness that the day brought. To finish we ate the sweets that I would have made especially for Diwali and we would end the night outside, together, to enjoy sparklers, Catherine wheels and rockets galore. It never felt terribly cold, even if it was October or November because the light that was radiating from the house and the happiness of being together was warming me up from the inside. As the story goes (when you tell it to a child)………. Once upon a time, the banished warrior Prince Rama who was married to the beautiful Princess Sita found that his wife had been kidnapped by the 10 headed 20 armed Demon King Ravana who decided he wanted to steal Sita and make her his own. Rama was determined to find and rescue his love from the Demon King. Sita had hope that her love would find her and so she left a trail of her shiny jewellry for Rama to find and follow. Rama followed the trail until he came upon the monkey king, Hanuman, who he befriended and told about his dreadful loss and the quest he was on to rescue his love. King Hanuman decided to help Rama by sending messages to all the monkeys in the world who then passed the message to find Sita to all the bears too, who then started to look for Sita. After a torturous search, Hanuman finally found Sita trapped and imprisoned on Ravana’s Island, Lanka. With the help of the monkeys and bears and eventually all the other animals in the world they built a bridge and were able to get across to fight a mighty battle to get the Princess back. With a magic arrow, Rama killed Ravana in the chest. Everyone in the world rejoiced. The banished Prince and Princess needed to make their way back to the land they had been banished from. To help them find their way back to Ayodhya, the people of their land lit oil lamps in order to welcome them and help guide them back home where they belonged. Ever since the story of Rama and Sita finding their way home with the help of lit oil lamps, Hindus all over the world light oil diyas (clay oil lamps) on Diwali to remember the triumph of light over darkness and how the light always guides you home. I guess it is the story of Diwali that resonates with my feelings of togetherness and home during Diwali. The light always brings us together. It is not quite the same without Dad, but we still continue the ritual. The void is greater this year. My dearest sister is not here for Diwali. She is a few thousand miles away and although it is not the first Diwali I can recall that we have not spent together, she is certainly missed. 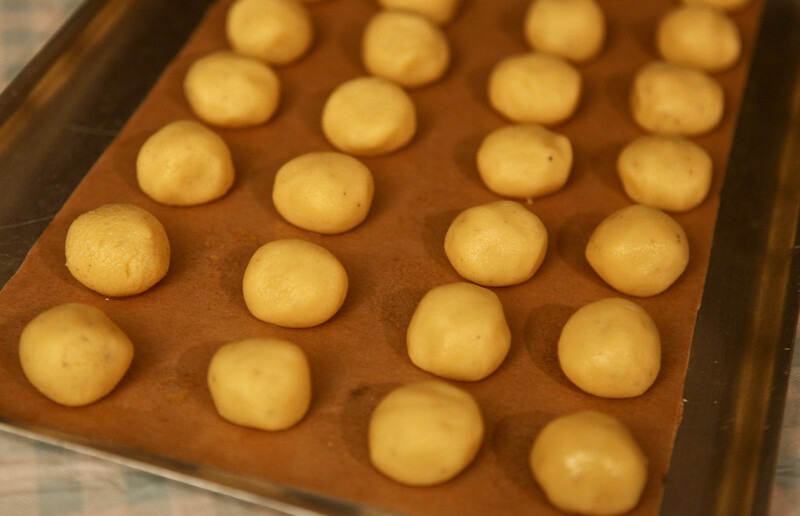 Today as I was busy in my annual ritual of making my homemade mithai (sweets) for Diwali, I got a Skype call. All that basking in the Caribbean sun hadn’t allowed her to forget that she was missing the togetherness we share at this time of year and have done for nearly 30 years. How time flies! As I continued my mithai making in the kitchen we chatted and she told me how she was planning to celebrate. She had already talked to Mum about what she could make and had taken some recipes. I asked her what she would make as prasad. I normally take a plate of mithai I have made and offer it as prasad for the pooja. She wanted to make halwa and had already got the recipe. As we were talking I suggested making some mithai. 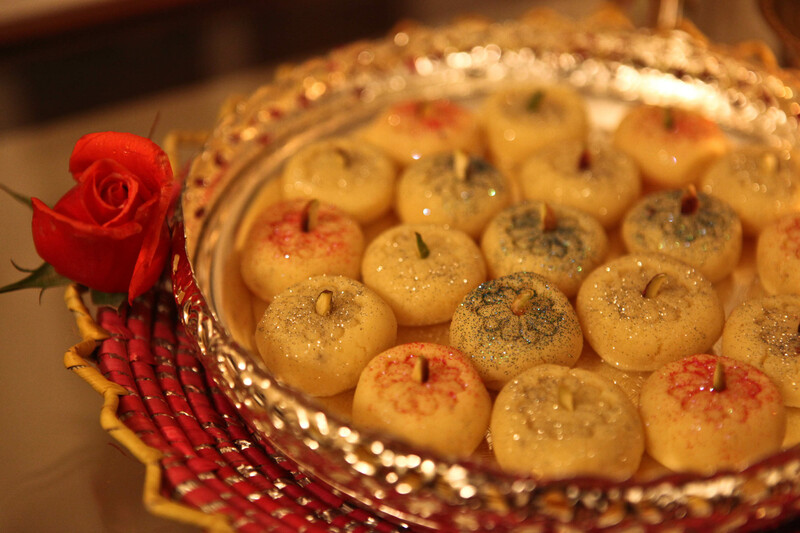 Although she had never made any mithai before, I had the perfect recipe for her that was extremely simple, quick and of course, delicious; not to mention a favourite of hers: a perfect last minute mithai. I decided to make it for her, to show her how quick and easy it is. It is a recipe I came across online a number of years ago. After a couple of tweaks, (not that there are many you can make considering the fact that there are only 3 main ingredients! ), I came up with my favourite version and I decided to share it here, too. I am sure you will have lots of compliments and success with this recipe for years to come. I usually avoid microwaving anything unless absolutely necessary and even then, it is only for heating something up or defrosting. I much prefer to cook on the hob or cooker and in fact I have never cooked something from scratch in the microwave. Until now that is. This will not start my foray into microwave cookery, I can assure you. But these truly are the quickest, easiest, most versatile tasty Indian sweets that you can make and perfect for when you’re in the need to a last minute dessert or gift. Nothing shows you care as much as when you make something especially for someone. Pick one of the following flavour options: plain, cardamon powder 1 tsp, vanilla extract 2 tsp, rose water 2 tsp, kewra water 1 tsp, nutmeg 1/2 tsp, cocoa 2 tbsp + 2 tsp vanilla. For garnishing slivers of pistachios or almonds, edible glitter, other cake decorations. Take the homemade ghee or butter and put it in a medium to large Pyrex bowl and microwave until melted- depending on the power of your microwave and how cold your ghee or butter is, about 30 seconds- 1.5m. 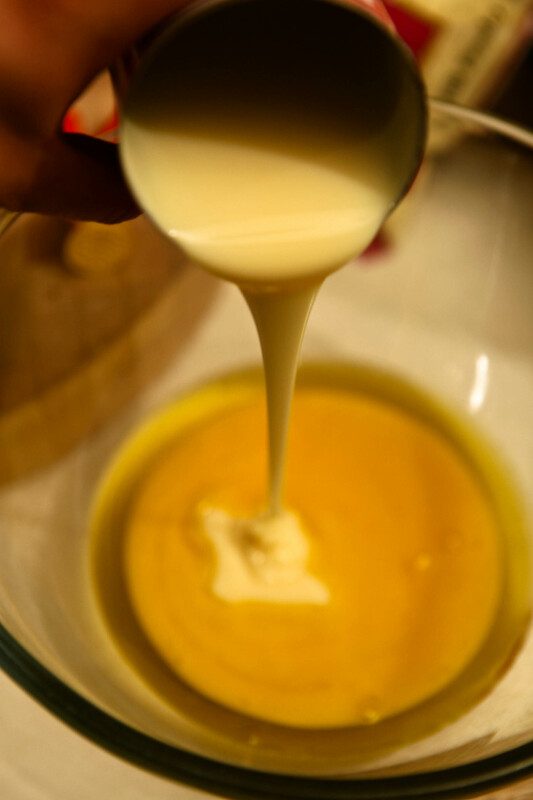 When melted, add the entire tin of condensed milk, the milk powder and the flavouring of your choice (and colour if you are using). Stir well and put back in the microwave for 3-4 minutes depending on the power you have. Check and stir well every minute. After 3-4 minutes is up the mixture is ready. It should be a thick dough like consistency now. Stir well and leave to cool for about 5 minutes. After 5 minutes the mixture will still be hot, but you should be able to handle it to make balls. 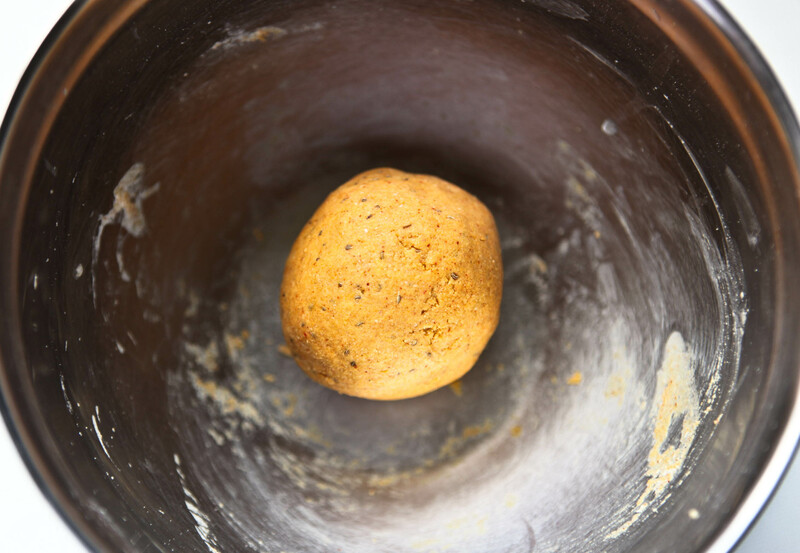 Divide the mixture into tbsp size balls, roll in your hands and place on a tray lined with grease-proof paper or foil. 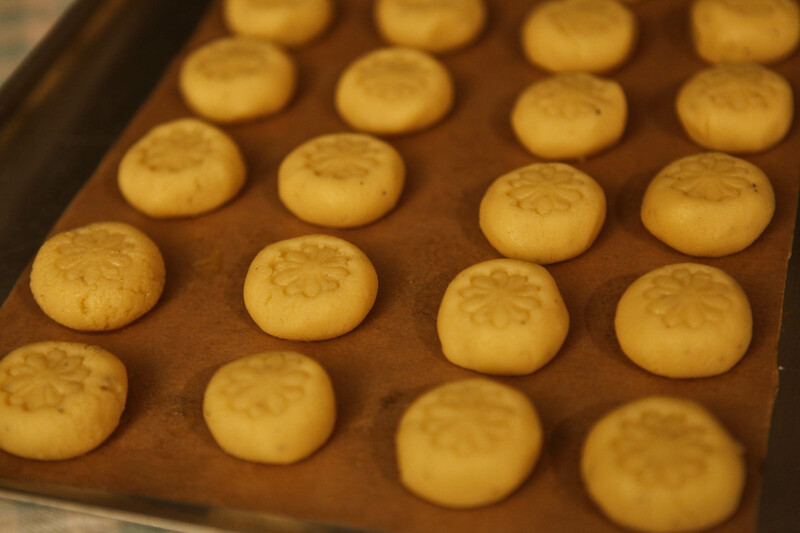 Once all rolled, make an indentation in the top of each peda which will flatten them slightly. You can use the tip of your finger or a stamp like the kind that I have used or another implement of your choice to make a design. Finally garnish with nuts if you are using and or other decorations such as edible glitter. Leave to cool and within 15 minutes they will be cool and ready to serve! And they were a resounding success in Jamaica, too! She added her own little twist….that gene really does run through both of us! 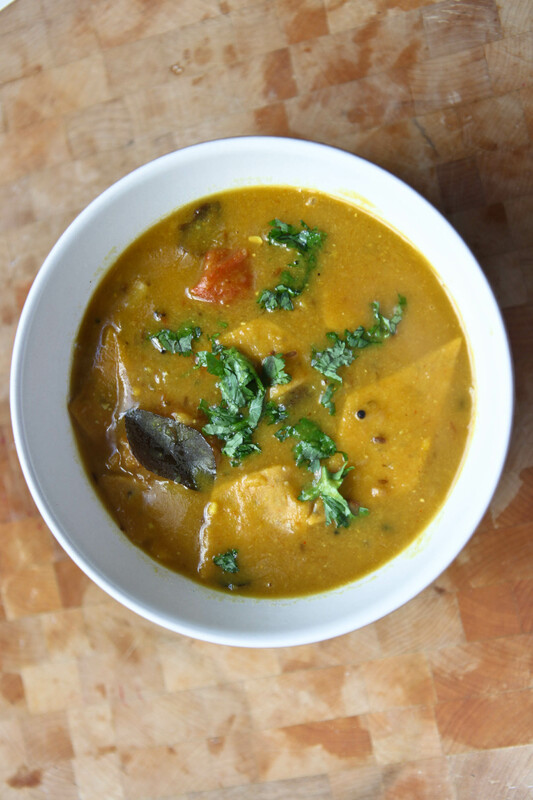 *Meat Free Tuesdays* As the stormy weather ensues… Let a warm wholesome bowl of Kadhi warm your insides. The changing of season has arrived. I finally went outside to check what if anything was still growing in my vegetable boxes. I wasn’t hopeful seeing that we have had some awful weather the last week or so. Surprisingly, I found some tomatoes among the kale and spinach. 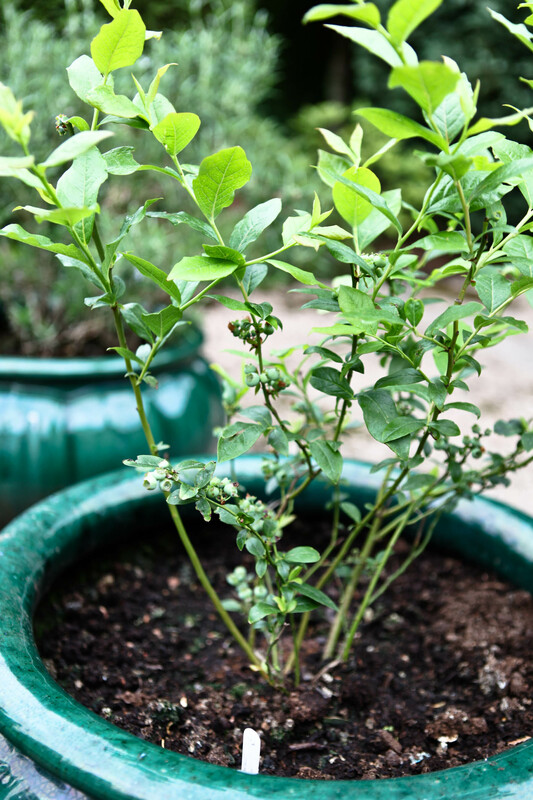 Green, ready to take inside to ripen and beautifully formed. The tomatoes have been one of my favourite plants that I have grown this year. The taste of home-grown tomatoes cannot compare to anything I have ever eaten in the UK. The closest would be when I have eaten them in the Med, Kenya or India. I can honestly say I grew the most delicious tomatoes I have ever eaten! 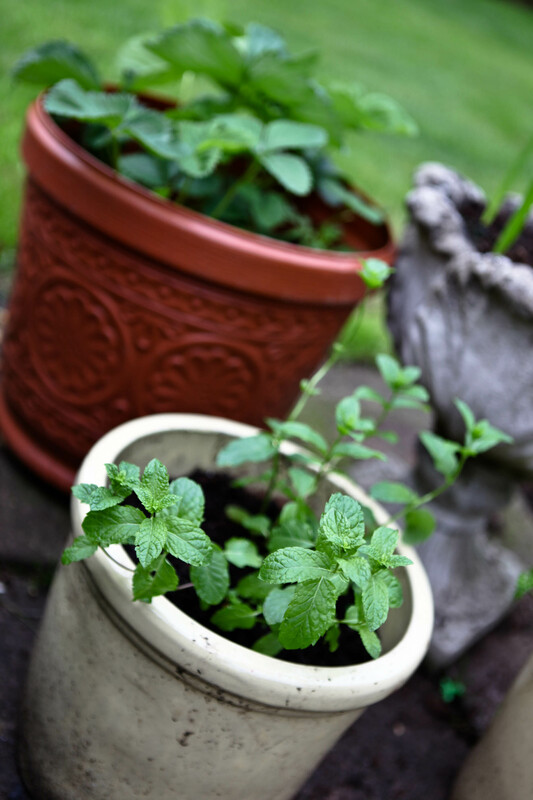 However, next year I will grow them better by spreading out the plants more so that they grow bigger. And I want to try to can them, too. The thought of using store-bought canned tomatoes is pretty unappealing now since I have been spoilt with the taste of my home-grown babies. Saying that, there are times when convenience overtakes and so I am sure I will not abandon the canned version completely. Today I am sharing one of my favourite vegetarian Indian dishes- one where I have incorporated some of my home-grown tomatoes! I chose this today because it’s something completely comforting and simple to make. It’s warm, uplifting, sun like yellowness and soupy consistency perfectly carries flavours and spices to sooth your soul. My favourite kind of dish. 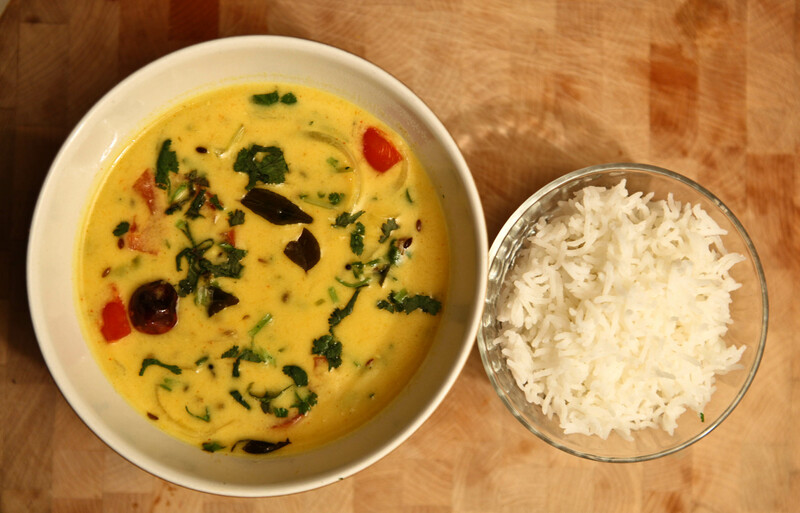 Kadhi, is most simply put as a spicy yogurt soup. I have to say, It doesn’t sound quite right; hot yogurt sounds wrong to me. However, although not eaten like a soup- more like a dal would be eaten- with rice or chapattis, the main ingredient in this dish is yogurt and it is eaten hot, therefore that is how I will describe it! 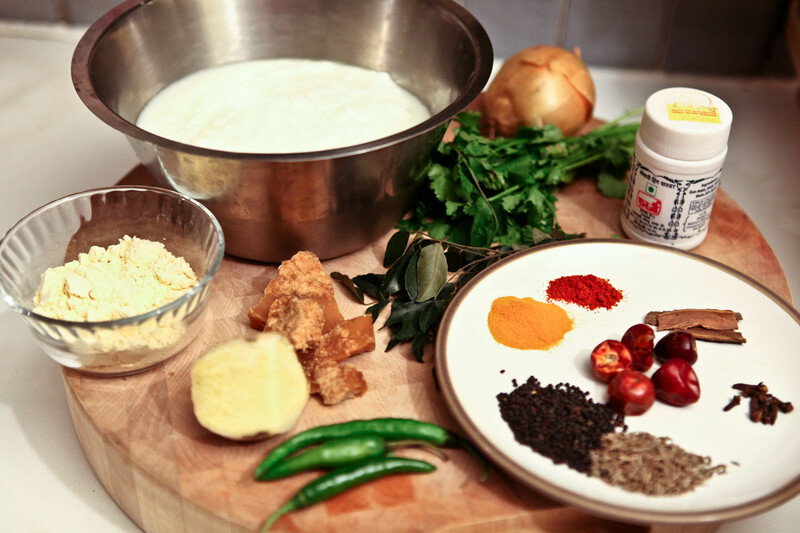 Traditionally kadhi would be made to use up the left over yogurt from the previous day’s meal. Yogurt is eaten with almost every meal in my family. And in India where yogurt was never bought, but made fresh at home daily, there were always left overs. You would never normally eat the yogurt from the previous day as it would be slightly more sour and it was so easy to make yogurt. Instead you’d be spoilt with taza – or fresh yogurt at every meal. In England I do make yogurt most weeks, but I don’t have the luxury or need to make it daily as I don’t make Indian food daily. If I make it once a week, I am happy as there are still some left overs for making kadhi or other tasty dishes that require sour yogurt so it all gets used. If I fancy kadhi and I don’t have any yogurt store-bought natural live yogurt works just as well. There are many different kinds of kadhi from different regions of India. My family’s kadhi is of the Punjabi variety, made with yogurt, spices and chickpeas flour, it also has the addition of pakora dumplings. These are fried dumplings made from chickpeas flour, onions, potatoes, spices and any other vegetables you may want to add. 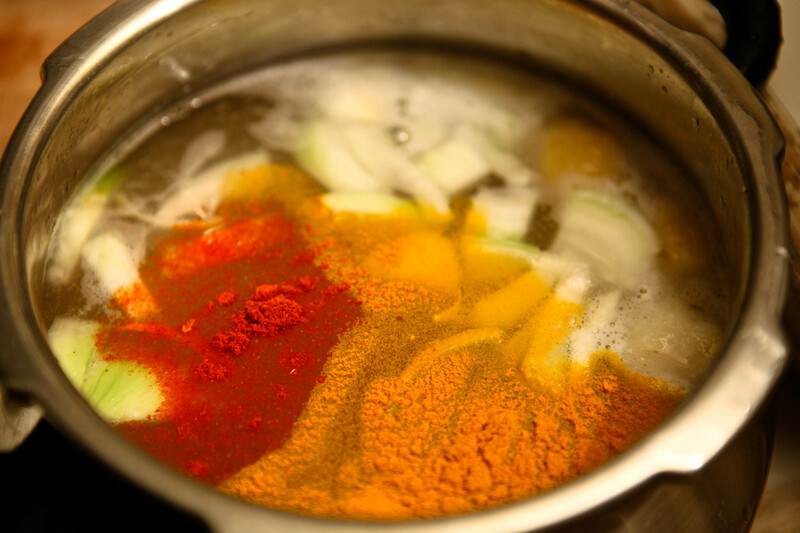 Once fried they are added to the hot kadhi to simmer until softened. 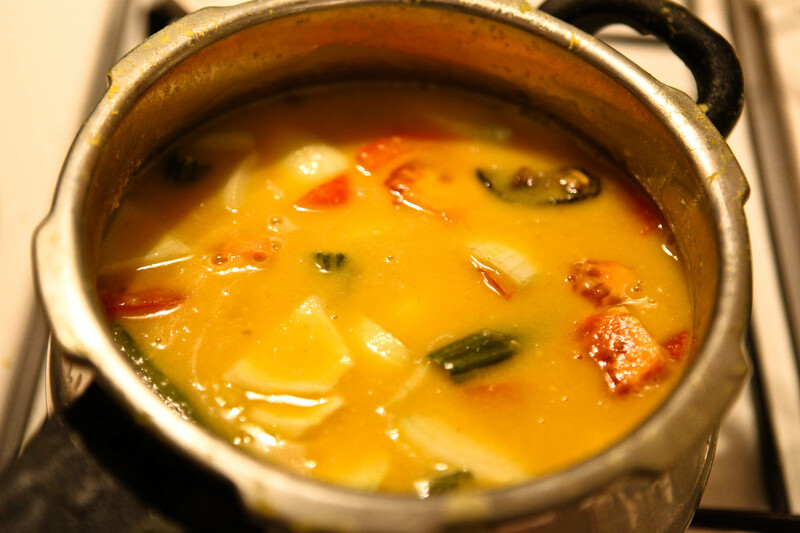 Often vegetables such as carrots and onions are added to the kadhi for added heartiness and to balance the sourness of the yogurt. 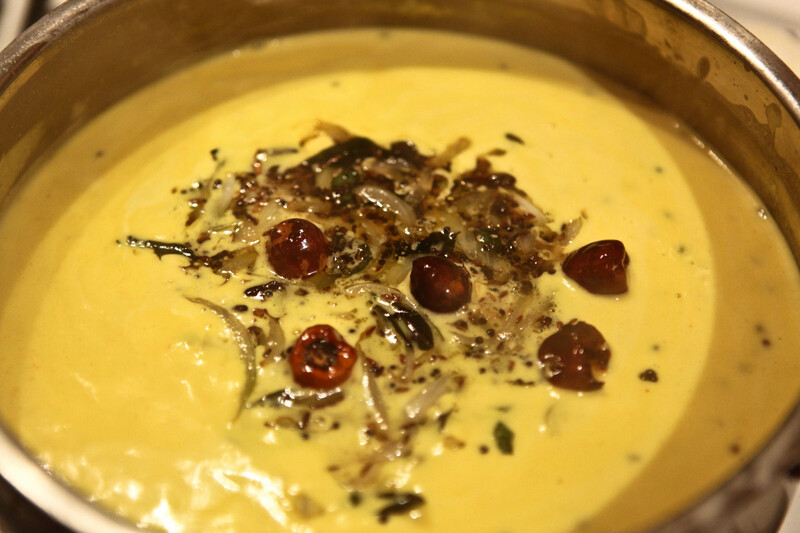 Punjabi kadhi is generally thick in consistency like that of a thick custard. The kadhi is served with rice or chappatis and makes for a wholesome meal. In Gujarat, kadhi is also made with yogurt, chickpeas flour and spices. The spices used are slightly different and the consistency is thinner -more soup like and there are no dumplings. The flavour also incorporates that signature Gujarati sweet and sour pairing due to the addition of jaggery or sugar as well as a slightly more pronounced warm gingery-ness. I tend to enjoy this style of kadhi more. The last one that I have tasted and attempted myself is Sindi kadhi. This kadhi is not made with yogurt, but is only made with chickpeas flour and spices. For the sourness, which the other two varieties get from the yogurt, tamarind paste is used instead. 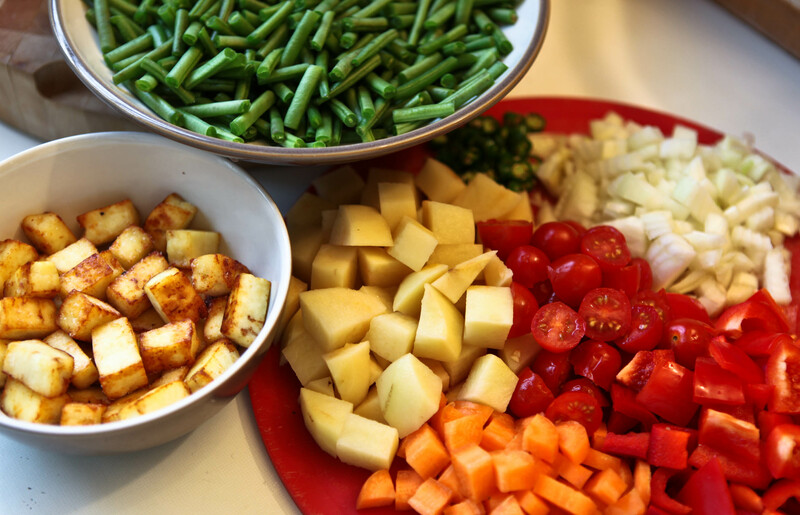 Various vegetables such as beans, potatoes, drumsticks (I used these in my Toor Dal recipe) and onions to name a few are also added. At some point I hope to share a recipe for this kind as the flavour is very different and it’s absolutely delicious. Serves 8 at least, but keeps well for about a week in the fridge. Flavour develops over time and is even more delicious the next day. My version as with most of my Indian dishes is a hybrid of a couple of different styles of Indian cooking. From a young age I have enjoyed both Punjabi and Gujarati kadhi. At home I’d enjoy Punjabi kadhi, sometimes with pakora dumplings and sometimes with sweetcorn. The flavour was the proper Punjabi flavour- no added sweetness- just the sourness from the yogurt and the natural sweetness from the vegetables that were added. It was important that the yogurt used was not overly sour for this reason- a day or two old was fine. My family had many Gujarati friends both in Kenya and in England and kadhi was a popular dish that I would have often when visiting. As I described above, although made with similar ingredients, it was a thinner consistency and there was a much more of a balance between the sweet and sour flavours for me. Oh and it was hotter too. Gujaratis like their chilies! I have taken my favourite parts from each and made my own. Kadhi is a versatile dish and so you can add whatever vegetables you fancy to vary the flavour. I like to serve it with plain boiled basmati rice. 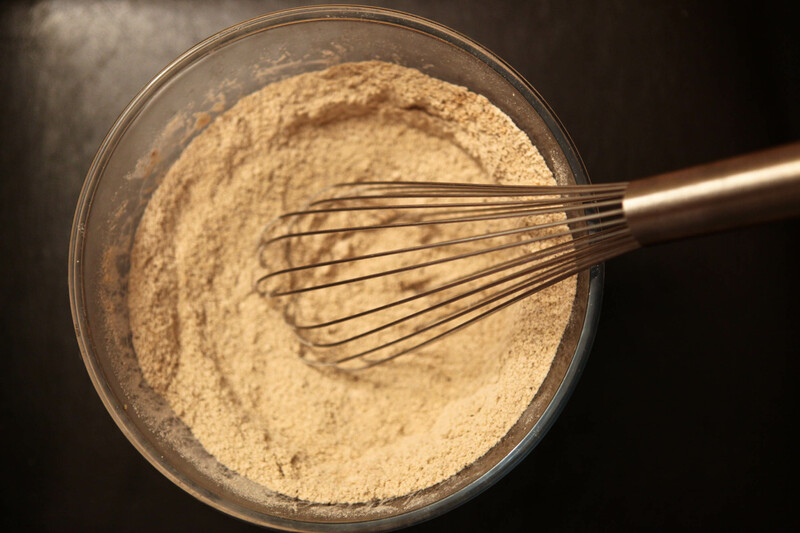 5-6 tbsp chickpeas flour – besan (the more you add the thicker it will become) 5-6 gives you a single cream consistency. Punjabi kadhi would have at least a 1/2 as much more. 2 tbsp homemade ghee or butter or a mix of oil and ghee/butter. I never use store-bought ghee for cooking as I find the flavour and smell unappetizing. To me, it’s not what ghee should smell or taste like. It is very easy to make your own ghee at home and you will find a huge difference in the taste of your dishes because of it. If you do not have the time to make ghee, I would always recommend use butter instead of store-bought ghee. Just be sure not to heat it too high as butter has a tendency to burn because of the milk solids that are still in it. Take a large heavy based pan and put the yoghut, chickpea flour,, turmeric, red chili powder and coriander corriander powder in. Mix well to ensure there are no lumps. Next add the grated/crumbled jaggery, finely chopped green chilli if you’re using it, the grated ginger, and the whole coriander seeds. Mix well and finally add the 6 cups of water, stir and put on the cooker to bring to the boil. Ensure to stir periodically to avoid lumps. While the kadhi is coming to a boil make the tarka. 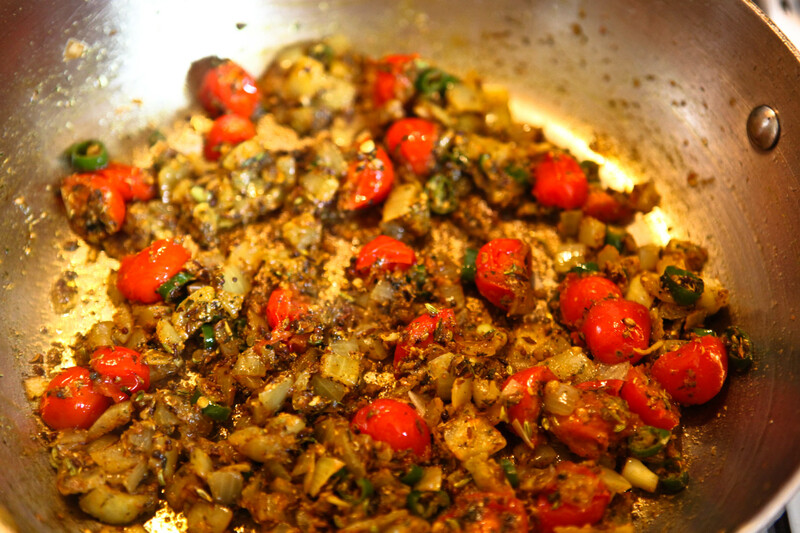 This is the heart of the dish- where the oils from the spices are released to impart delicious flavour through the dish. In a frying pan heat the ghee/butter/oil until hot. Add the cumin seeds, mustard seeds, whole red chilies, cloves and cassia/cinnamon sticks. Fry for 20-30 seconds until the mustard seeds are popping vigriously. 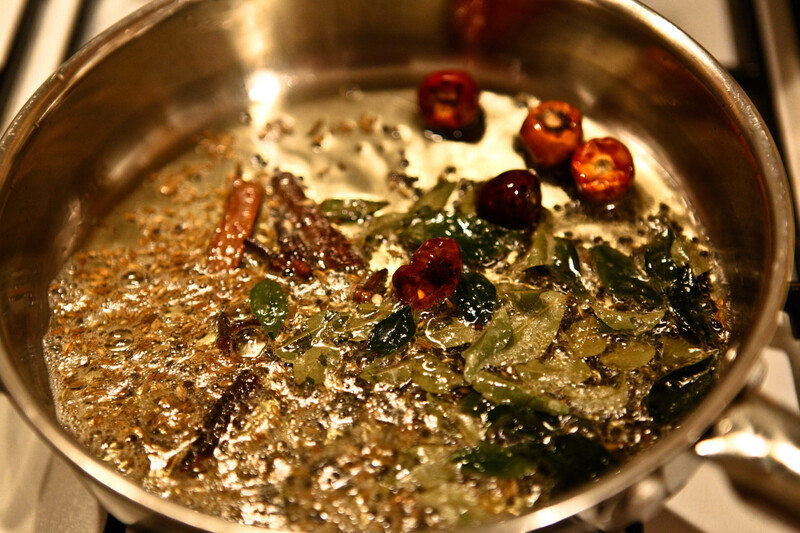 Now add the curry leaves which will spit quite a lot if they are fresh. 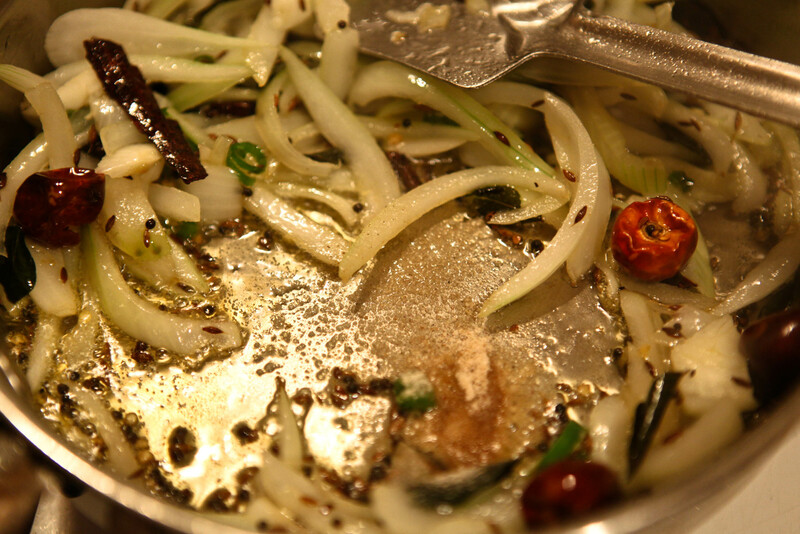 allow them to spit for 10-20 seconds before adding the green chillies and onions together. 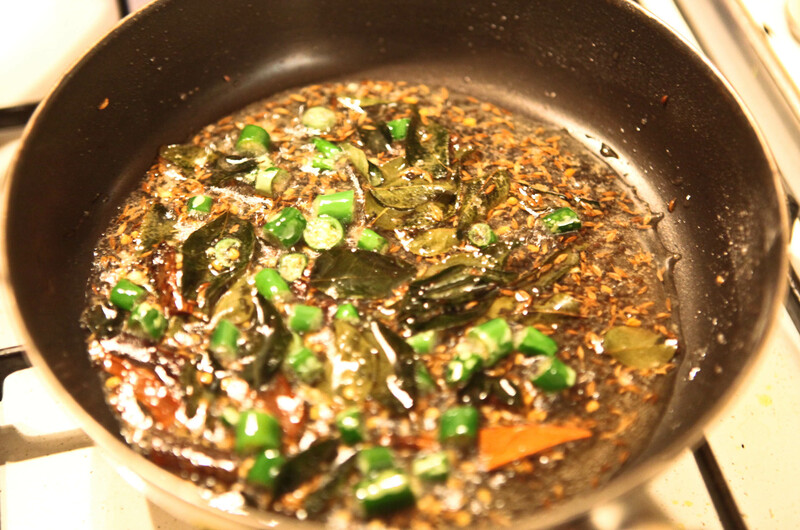 Let the green chillies and onions cook on high heat until they start to soften. You don’t want them to go brown. Just to sweeten by softening them a little. Finally make a little space in the frying pan by moving the onions to the side and add the asofodetia. Allow this to fry for 10 second or so before stiring it into the onions and tipping the entire contents of the pan into the kadhi which should have started to thicken. To get all the flavour from the pan I usually add a few spoons of the kadhi into the frying pan, stir around and tip it back into the kadhi. Stir the kadhi well and bring to a boil. Add salt to taste- about 1 1/2 tsp should do… Add less first as the yoghurt may have some salt in it. 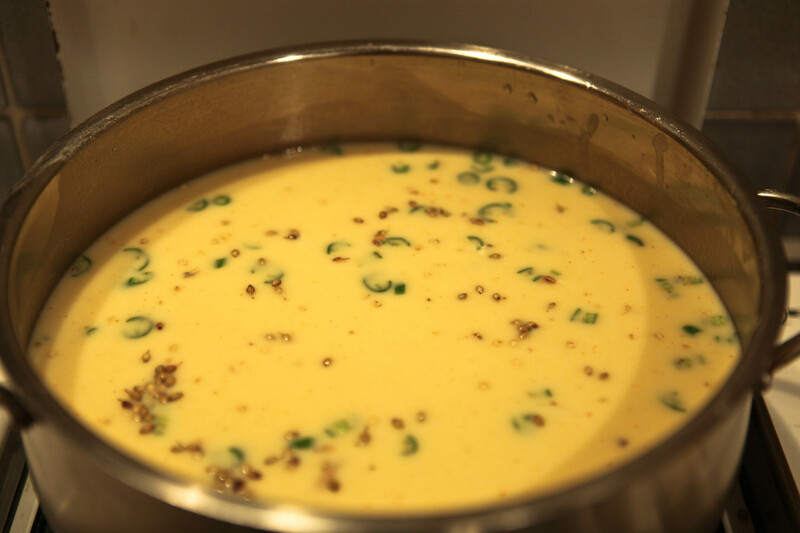 Let the kadhi cook on a simmer for 10 minutes or so to let the flavours of the spices develop. About 5 mintures before serving add the tomatoes and stir. You can switch off the heat when you do this. And top with the chopped coriander. Serve with a bowl of freshly cooked basmati rice. So I was walking on Oxford street the other night and it was surprisingly noisy considering the time of night it was. As I looked ahead, there were huge cranes towering with people on them making lots of drilling noises. As I got closer I could finally see that they were erecting London’s Christmas lights; the huge light studded umbrellas and Christmas presents that were going to adorn the streets for the next few months. It brought a feeling of coziness and warmth to me. Something I needed since summer never really re-appeared since I last posted. The thought of Christmas approaching has sated my being. Speaking of when I last posted, it has been a long hiatus during which many things have happened…many dishes prepared, recipes discovered, new people, old people met, new places, old places travelled to; not forgetting to mention my garden harvest that was bursting with plums, apples and pears as well as a plethora of other delicious edibles that I was quite proud of. I have to say though, I haven’t been in the kitchen as much as I would have liked these past few months. My spirit has been dampened slightly. Sometimes things in other parts of your life take over and you can so easily forget the simple joys that your kitchen can bring. Anyway, I am back! And hopefully for awhile as I have a number of recipes that I wish to share, and although their seasonality is more or less over, I will endeavor to write posts soon. Today I am sharing a recipe for an extremely versatile dal recipe- Toor Dal (Split Pigeon Peas). 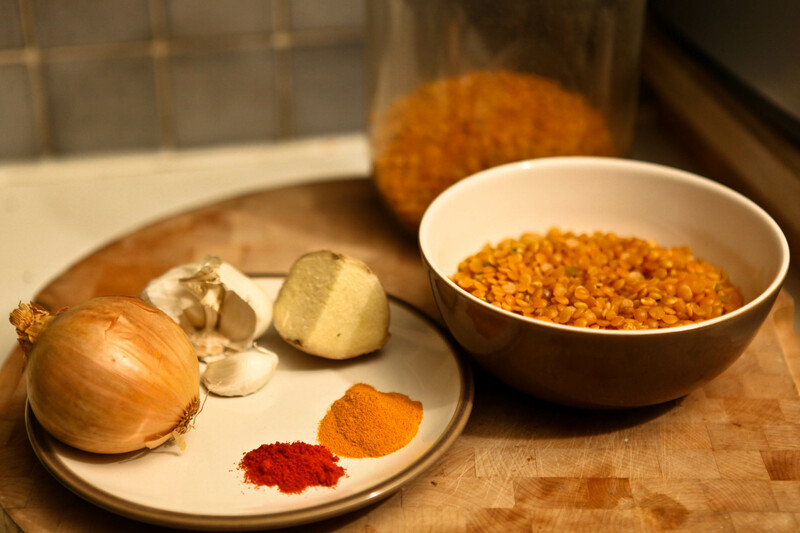 Although a dal that is not traditionally cooked by the northern Indian people, it is one that can be found in many different forms in other parts such as in the southern and western India. Being that my family originates from the North, toor dal is not something that you’d find in any Punjabi family’s repertoire Lucky for me and my family’s movement around the globe and India for that matter; our family has adopted influences from many other cuisines, one of my favourites and most prominent in our repertoire are influences from the Gujarati cuisine. Gujarati’s tend to use a lot of sweet and sour flavours in their recipes, hence the star flavours in this dish are jaggery for the sweetness and kokum phool for the sour (a dried sour flower that is specifically used in Gujarat- widely available in UK asian supermarkets. Gujarati cuisine incorporates sweetness in the majority of it’s savoury dishes, something unheard of in northern India. There are a number of dishes that my family make that have that Gujarati sweet and sour element fused with Punjabi flavour. The fusion dishes are sometimes the tastiest. 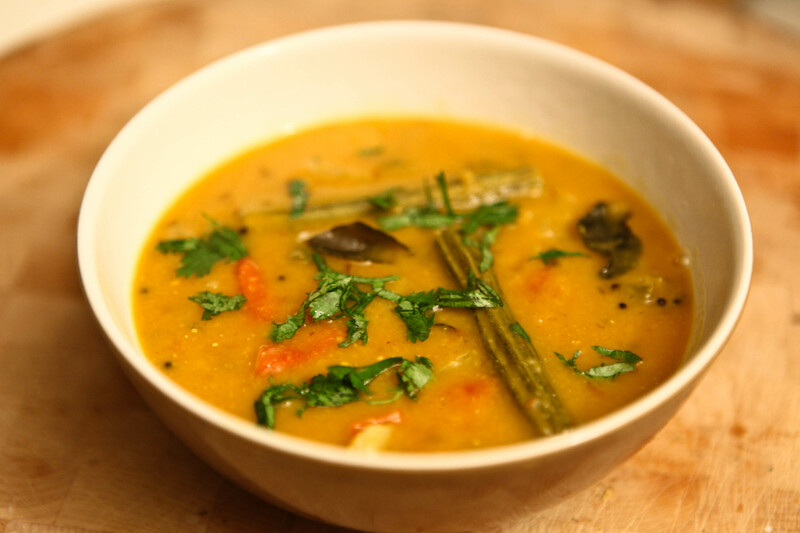 Toor dal is specifically made from split shelled pigeon peas. You can find these in Indian stores in two formats. Coated with oil or without. My family has always used the oil coated ones. I am not quite sure why, but if I remember correctly I was once told that they stay fresher when coated with oil…maybe the dry ones tend to taste bad if kept for too long? Regardless, the oil is washed off prior to cooking so I don’t think it would make much of a difference which you use. The recipe I am giving you today has some Punjabi influences, but the essence is Gujarati. It can be used to make two meals- one where the dal is cooked with a vegetable called drumsticks and the other uses the left over dal that you can transform into Dal Dhokali. 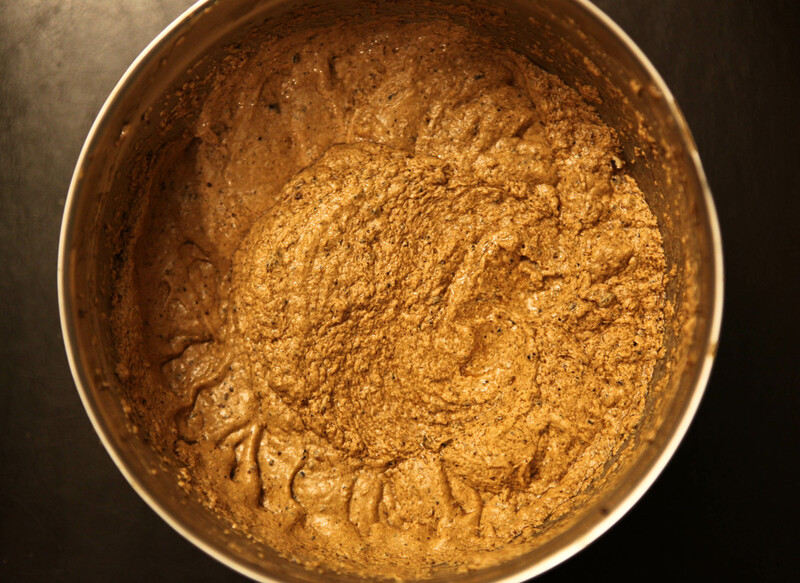 1 1/2 cups toor dal (oily or without oil) Wash both dals well, but if using the oily kind, rub well to remove the oil and wash until the water is more or less clear. You can also soak this dal overnight to shorten the cooking time. 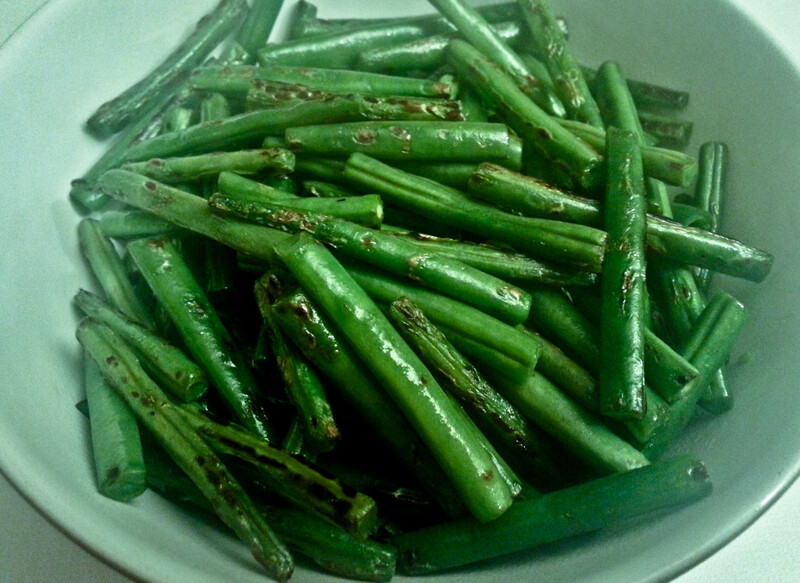 1/2 cup of dried kokum phool rinsed and then soaked in enough water to just cover them just before you start cooking. If you can’t find kokum you can substitute 1-2 limes or a few tbsp tamarind paste to taste for the sourness. Take all the ingredients for the dal apart from the jaggery, salt and kokum and put them into a large heavy based pan or a pressure cooker and top with 4-5 cups of water. If pressure cooking allow 2-3 whistles if you have soaked the dal, if not allow 5-6. You want to pulverise the dal as much as possible. If using a regular pan cook until dal is mashably soft- about 30 mins. 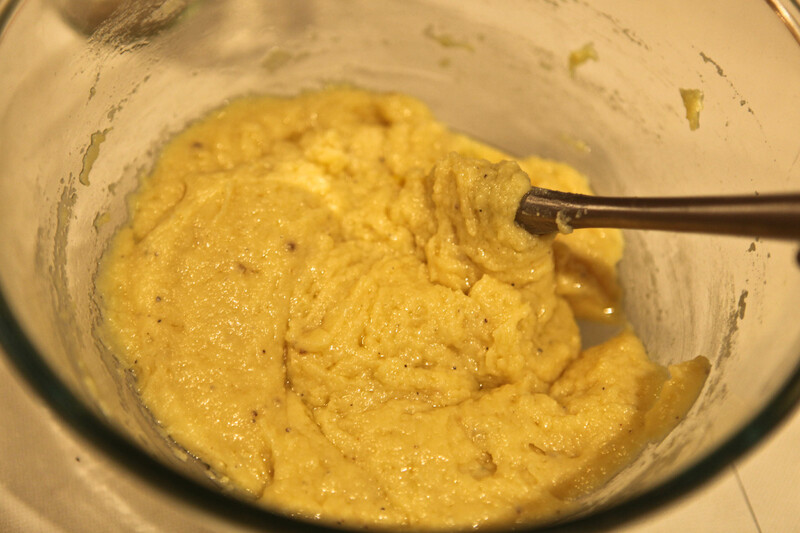 Once the dal is soft, take a hand blender or a whisk and completely mash the dal to a smooth consistency. Check the thickness- you want it to be no thicker than single cream. Add water accordingly. Also add the salt to taste, the kokum or lime/tamarind and jaggery. Bring to a boil and simmer for 15 mins. While the dal is simmering, make the tarka: Heat the oil and add the cumin, mustard seed, cloves and cassia bark and allow to flutter. Next add the curry leaves which will splutter. 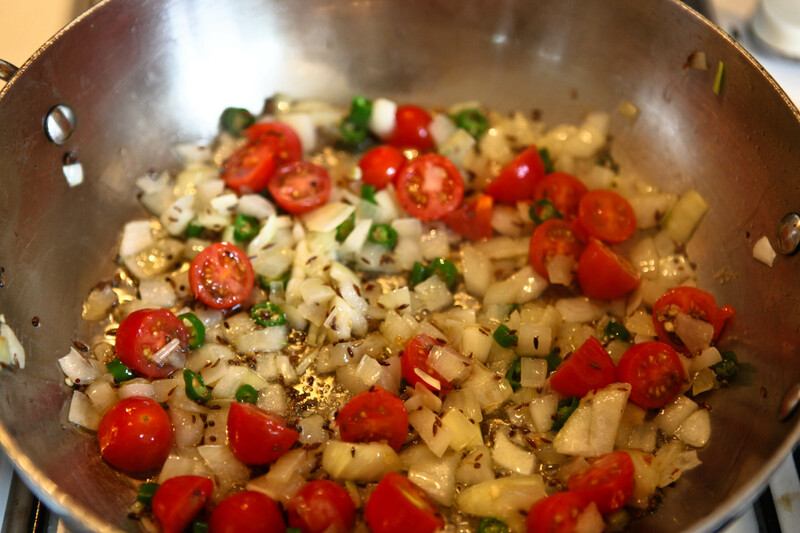 Add the green chilies and fry for a 20-30 seconds. Finally add the fenugreek seeds, the asafoetida and the coriander powder. Do not cook too much more as the fenugreek seeds can turn bitter (15-20 seconds). 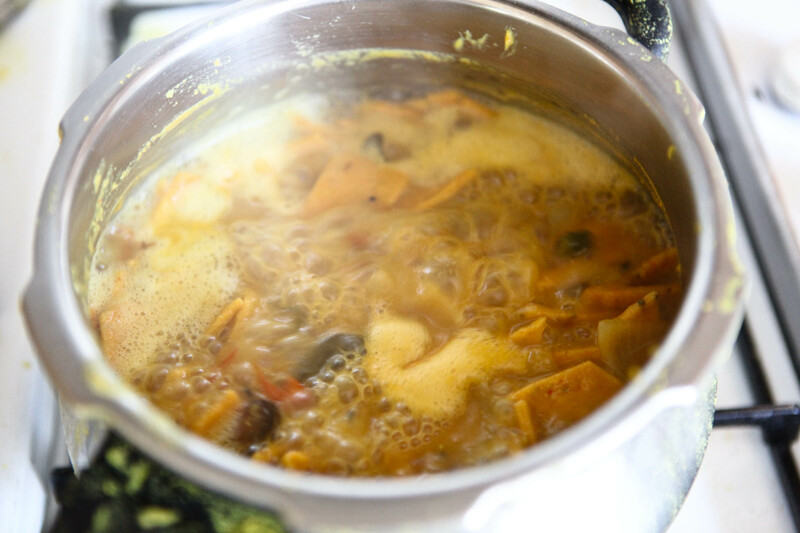 Add the entire pan of tarka to the dal that is simmering . Stir the dal well to distribute the tarka. Now taste to check salt, sweet and sour. There should be a good balance of all. Adjust by adding more jaggery if you need more sweetness, if there is too much sweetness add some lime or a little tamarind. Add the tomato chunks, onion chunks and drumsticks and allow to simmer for 15 mins. The dal is now ready. Garnish with coriander and serve with plain steamed basmati rice. The recipe for the dal is as above. 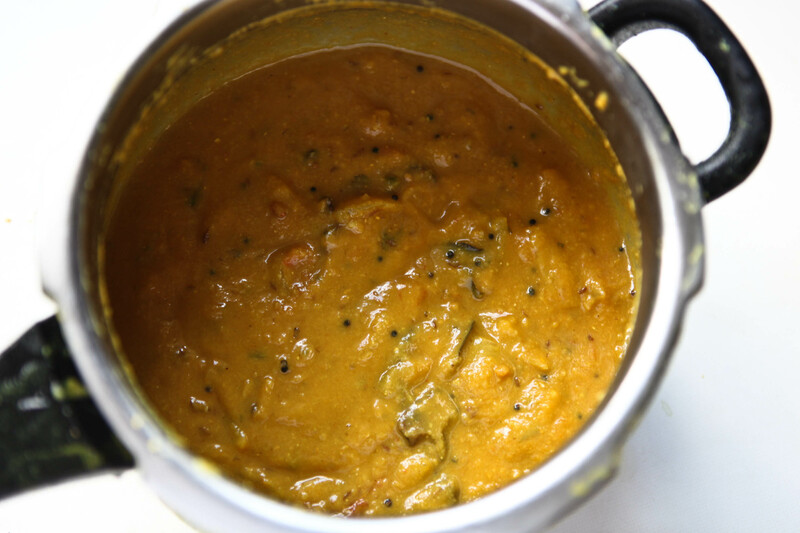 If you are using left over dal you will need to thin it – add 1-2 cups of water for a more brothy consistency. The quantity of ingredients given here is enough for left over dal. If you are making the dal fresh, I suggest doubling the dhokali recipe below. 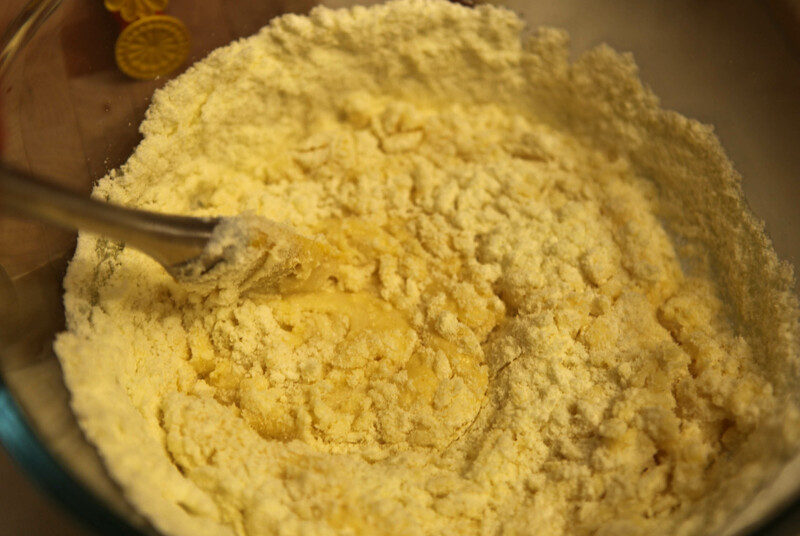 Mix all the ingredients in a bowl and make a stiff dough that will roll out with ease- about the texture of playdoh. Add water to left over dal and check seasoning. Adjust accordingly, bring to a boil and allow to simmer. If using fresh keep it on a simmer. 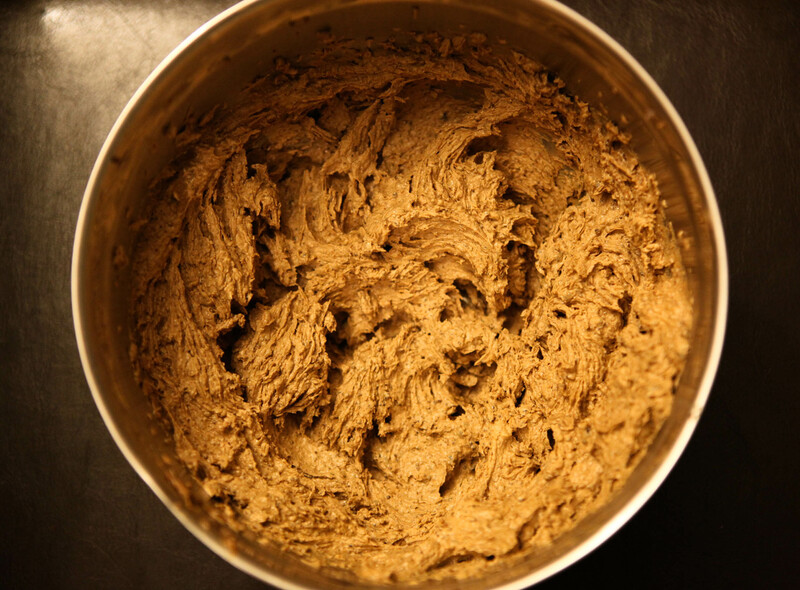 Divide the dough into two pieces and roll out each one as thinly as possible- a couple of mm at the most. Use either flour or an oiled surface to help you roll. Use a pizza cutter to cut out diamond shapes as the picture below shows. 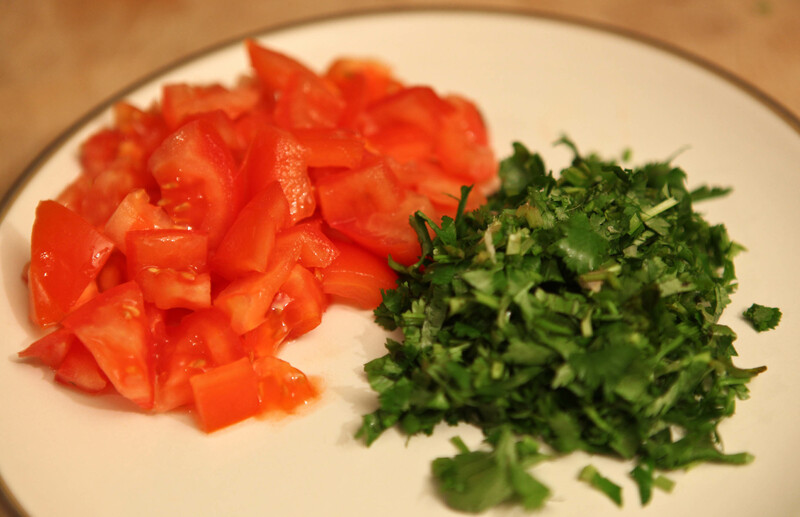 When ready serve and garnish with freshly chopped coriander. I feel a sudden influx of posts coming your way courtesy of the glorious British summer Sun that decided to reappear sending Rainy Rains-A-Lot far, far away (fingers crossed!) Too much fun has been sucked out of summer, it was about time, not to mention that it was high time the sun started doing it’s job and ripening the last of my blueberries! While I wait for the Sun to ripen the last of the fruit on the blueberry bush I procured in early spring and various other delicious edibles I have growing in the garden, I picked up a couple of punnets of my favourite berry from the supermarket the other day to cheer me up. Blueberries blueberries blueberries. There is something about the blueberry that makes me entirely happy. As I pop each fat, juicy, flattened marble berry in my mouth I feel that purple-y goodness doing it’s job! I usually don’t like to cook blueberries I prefer eating them raw and will only end up cooking them if I feel that they are not at their absolute best to enjoy eating fresh. The blueberries I bought the other day had been forgotten as I have been in and out of town a lot recently. Trying to save 2 large punnets from their diminishing freshness by consuming them all in one go was a bit much. To add to this list of forgotten fruit, I had also bought a baby super-sweet pineapple and some new season nectarines that were nearing the end of their peak ripeness too. As I strongly dislike waste, there was a lot of fruit to make into something tasty. When I eat blueberries raw, I usually buy them together with either peaches or nectarines if they are in season. I chop the fruit up to match the berry size up and mix together. This makes a delicious combination. Another favourite combination, actually, probably my most favourite way to eat them is with chopped fresh pineapple. With the addition of some freshly shredded mint, the combination is DIVINE; I don’t think anything could make me remember what summer should feel like or pick me up more than this on dreary days like we’ve been having. After the best nectarines were eaten, I decided to slices a few of them up and add them to half the blueberries to make a tart. While slicing, a bottle of Elderflower cordial caught the corner of my eye. Every summer I have a ritual that I started a few years ago to buy a bottle of Elderflower cordial and a bottle of St Germain (Elderflower liqueur) at the start of summer. There is something that is just so quintessentially British about Elderflower (although St Germain is entirely French…which kind of makes me love it more….and the bottle too.) and even if the weather is not so good, the mere smell of it reminds me that it’s summer. It’s one of my memory flavours. I will happily drink a concoction of St Germain & Gin (sometimes topped with Champagne) on any summer night, if only to act as a reminder that we are in fact in July/August and not October as the weather would like to have us believe. Anyway, the memory flavour got my experimentation juices going and I decided to pair the blueberries and nectarines with the elderflower cordial. 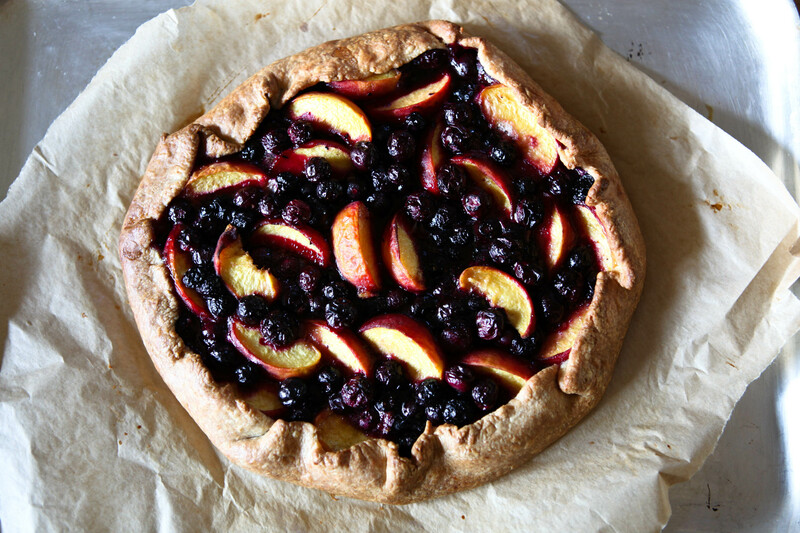 In my head I’d married the most perfect summer flavours together, so I doused the sliced nectarines and blueberries in a good 3 or 4 glugs of cordial while I set my sights on the pastry base. I always have pastry in the freezer- especially sweet tart pastry as you never know when you need a quick last minute dessert and a tart can be quite impressive at short notice! My slabs of pastry are flattened quite thin before I freeze them purely for the reason that they defrost quicker this way (10-15 minutes tops). I was feeling particularly lazy and decided that I wouldn’t even bother with a tart tin so once the pastry had defrosted, I rolled it straight onto parchment paper that was on a rimless baking sheet into something that roughly resembled a circle, ready for encasing the topping. All that was required then was to mix some sugar with the fruit before tipping out the contents on to the pastry and gently folding up the edges to envelope what would become fragrant, syrupy, juicy jewels after some time in the oven. The tart was delicious and I would definitely make this combination again. In fact, I think it would make a delicious cocktail too! Peach nectar muddled with blueberries, mint, some glugs of St Germain and topped with champagne. You know you want to try it! This is so simple, quick and easy. A perfect way to use up a glut of berries. Use whatever berries you have to hand. Raspberries would also work fabulously here. Serve warm with vanilla icecream. The perfect summer pud! 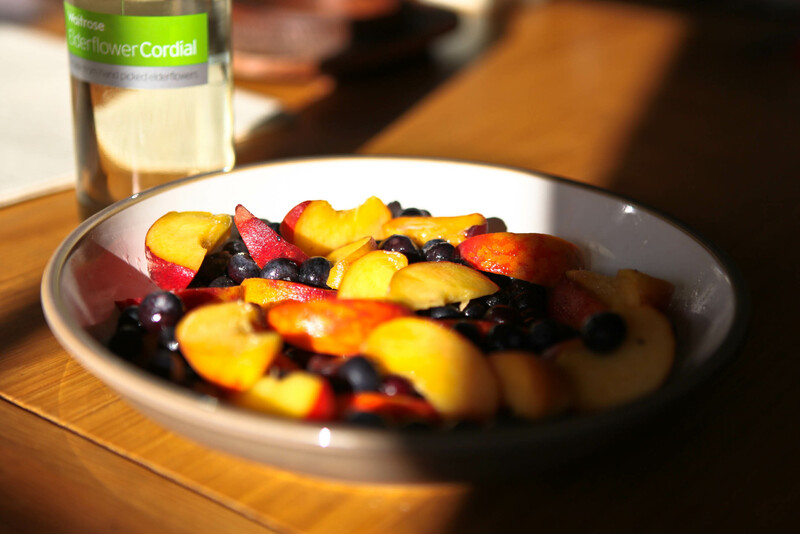 In a bowl place the sliced nectarines, blueberries and elderflower cordial and leave to the side while you prepare the pastry. 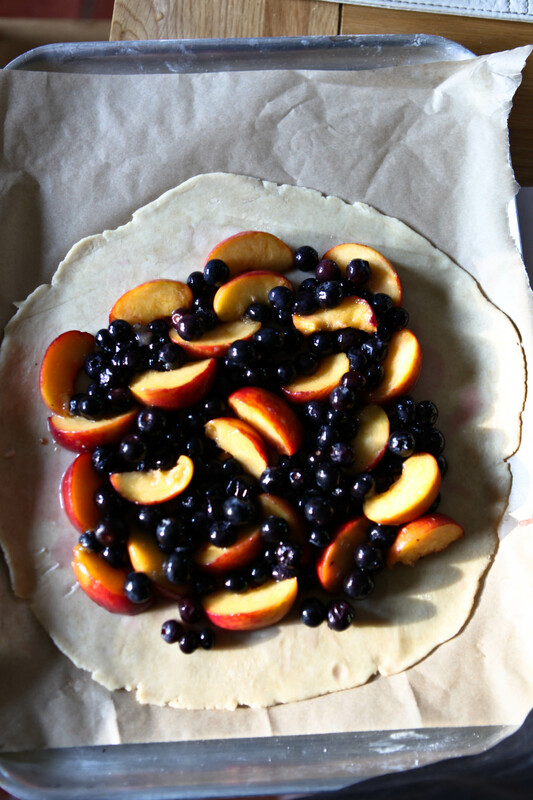 Fold up the sides of the pastry to envelop the fruit, but still leaving enough to show them in the middle. 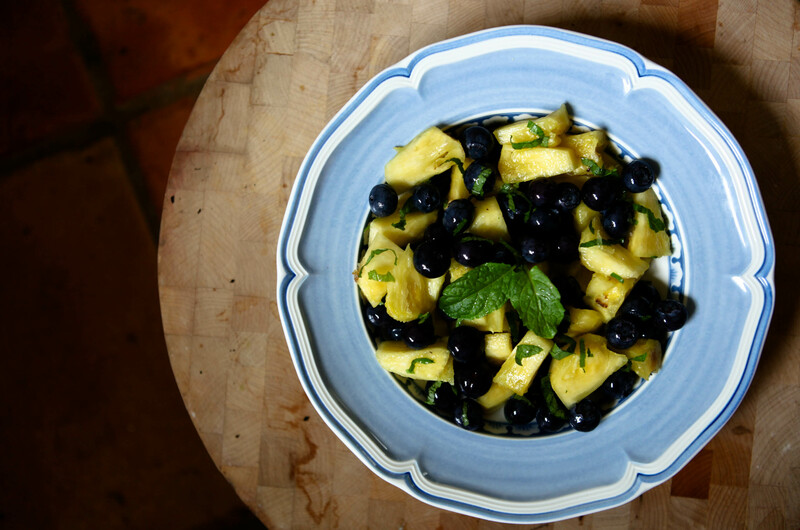 Seeing that I didn’t use all the blueberries, I ended up cutting the pineapple into small bite sized chunks and after nipping outside to pick some fresh mint, I finely shredded the mint it and garnished the fruit. The only good way to mix the fruit is with your hands and so with impeccably clean hands I ensured an even distribution of all the flavours. If you leave it to macerate in the fridge for an hour or so it’s even more delicious! My first July post. It’s the second week of Wimbledon and the first week in July, but of course, it feels like October! Welcome to the British Isles! Normally at this time of year I’d be craving delicious salads that I could dress with interesting concoctions, I’d be enjoying the best of the summer fruit and the long summer nights outside. Unfortunately, I don’t feel the slightest inclination to make a salad or even enjoy a simple bowl of strawberries today. After an extremely long weekend of labour, my plans for this week were dashed unexpectedly and the summer sun has hardly offered a glimmer of warmth to compensate, therefore my answer to this is soup. I’ve talked about the magic of soup in my previous posts and today called for some of the special pick-me-up kind. I was trying to decide what kind to make when I remember an episode of Rachel Khoo’s The Little Paris Kitchen. 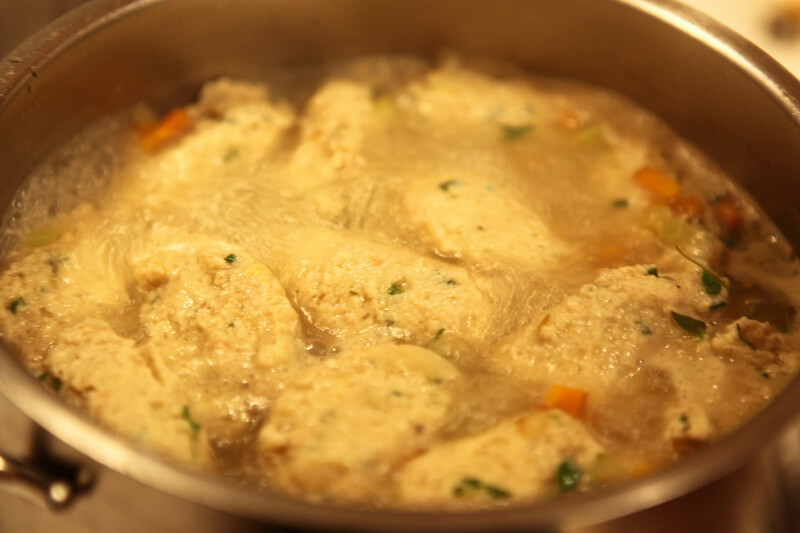 The one where she makes that delicious, quick and easy looking Chicken Dumpling soup. That was it. My heart made up my mind. Trying to remember the episode, I looked it up on YouTube and found the clip which was barely 3 minutes and so after a quick watch of the clip I set about gathering ingredients to make my own version. I had a quick walk outside to see what I could gather from the garden and after an armful of delicious produce( carrots, bay, thyme, kale and chives ) from my ever expanding kitchen garden (at least the plants are enjoying the rain in July!) I set about making my own rustic & hearty variation of Rachel’s recipe. This recipe yields enough quenelles for 2 lots of the soup recipe below. (About 32-36) I’d estimate this dumpling recipe serves 6-8 people well, but be sure to adjust the broth quantity accordingly. I made this recipe larger as I wanted to try freezing half the mixture for a super quick soup fix for next time or try poaching and then baking the quenelles in a Gratin de Quenelles de Volaille of sorts. I will keep you posted when I come around to it. 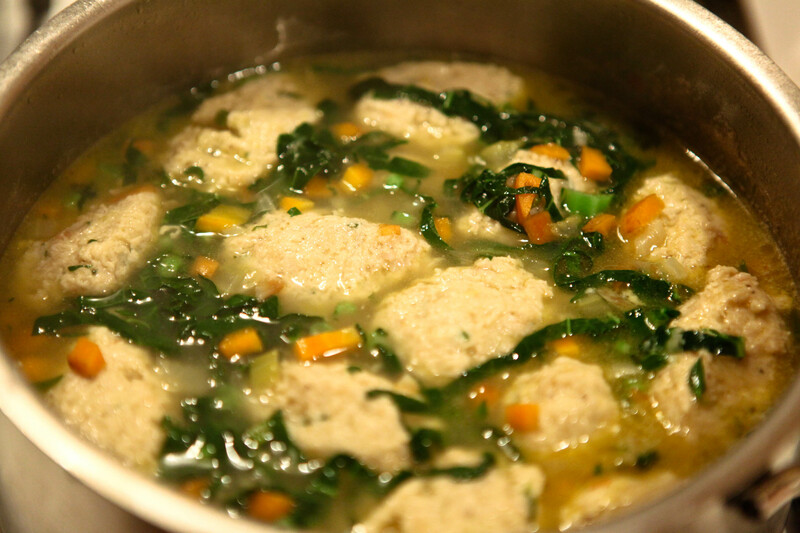 If you just want to make enough for the broth below, half this recipe. 400g skinless, boneless chicken meat. I used a mix of thigh and breast, but either alone would also work well. Ensure that tendons and gristly bits are removed. 200g stale white bread. The white bread adds to the fluffiness. 2 eggs and 2 yolks or 3 eggs will work too. More yolk adds a richness. If you’re halving the recipe 1 egg and 1 yolk would work best. 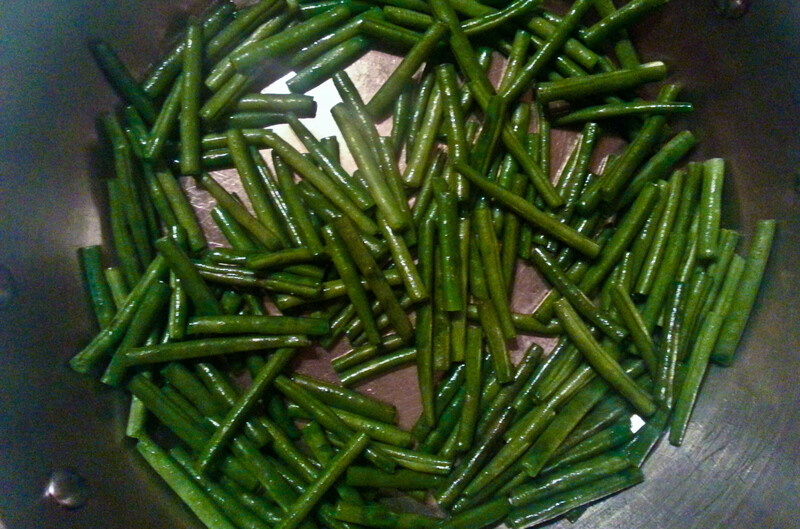 4-5 tbsp finely chopped chives. Take all the ingredients above apart from the chives and put in a food processor. 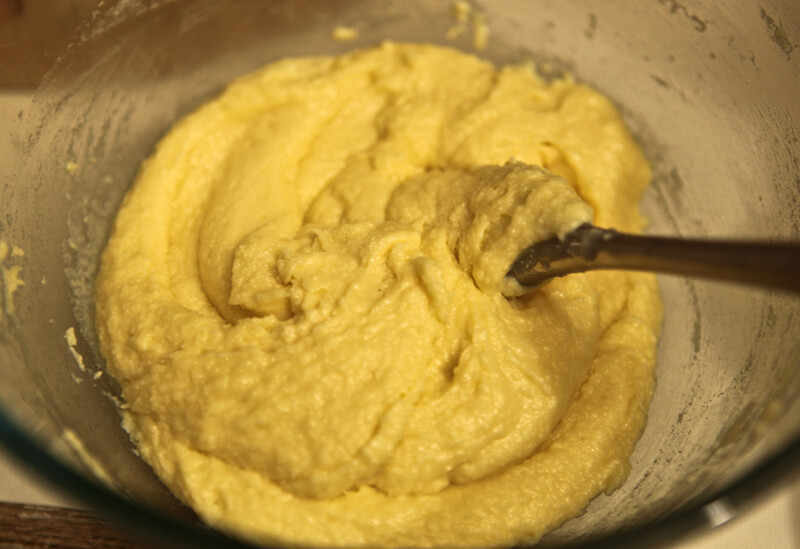 Blend until a whipped paste consistency in acheieved. Remove mixture from food processor bowl or if your food processor bowl fits in your fridge, then just take the blade out and stir in the chives well. Refrigerate the mixture while you prepare the broth. 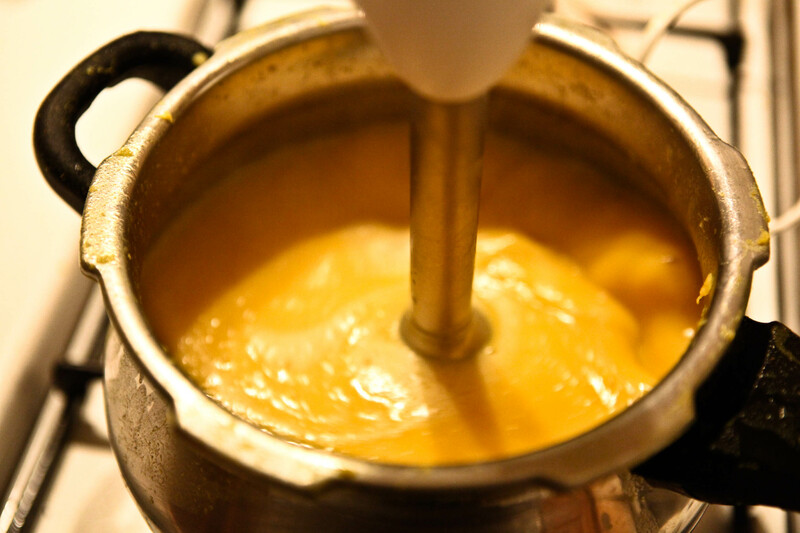 Once the broth is ready, make quenelle shapes of the chicken mixture by shaping with 2 tablespoons and drop into the broth. The dumplings are done when the float to the surface, about 5 minutes. 4 l homemade chicken stock (4 1/2l water, chicken bones of 1 or 2 chickens -I keep some bones in the freezer after a roast or when I am de-boning a chicken for something else, a bay leaf, small onion halved, 1 carrot in chunks. Simmer for an hr.) or if you’re in a rush an equal measure of good quality ready made stock or as a last resort 2-4 good quality organic chicken stock cubes/chicken boullion, quantity used dependent on the salt content. 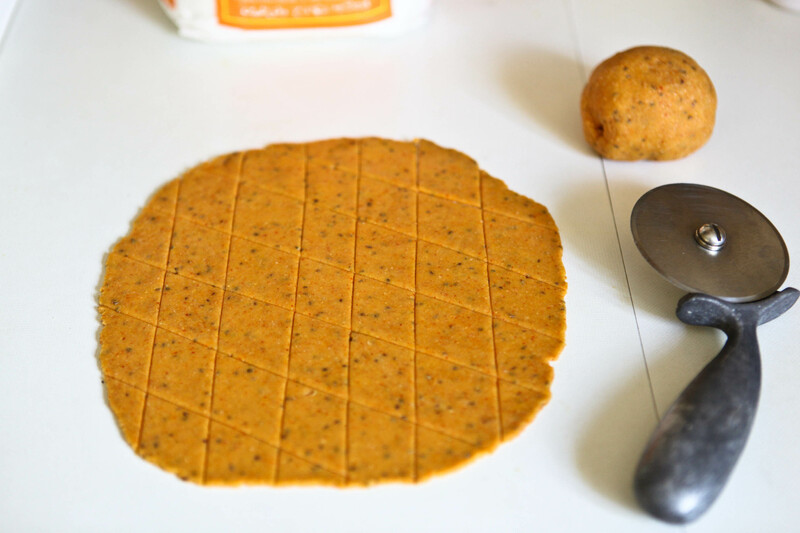 Try Kallo and taste for seasoning after the second cube. Add a bay leaf to the two alternatives for flavour. Heat a pan and add the oil and butter. I like to use some butter for the flavour, but some oil too as it doesn’t create a film on a broth soup as much as butter does. Sweat the onions for 5 mins on a medium heat ensuring that they don’t brown. 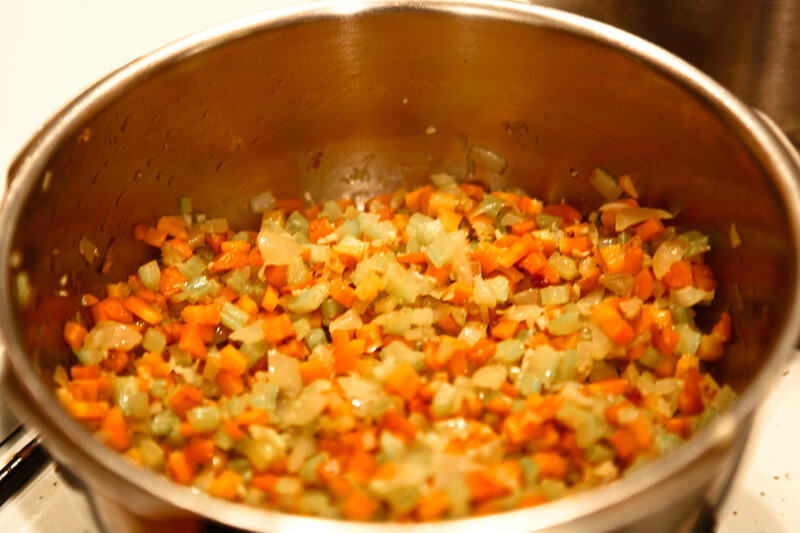 Add the celery and carrot and sweat for a further 5-8 mins or until softened. Now pour in the stock and bring to the boil before adjusting the seasoning. Finally add the optional apple cider vinegar. This really lifts the dish and cuts through the richness of the quenelles. Now follow the instructions above for cooking the quenelles. Once floating to the surface, switch off the heat and stir in the shredded kale and sprigs of thyme/parsley if using and serve immediately with some hearty sourdough. I have been extremely tardy with my *Meat Free Tuesday* posts the last few weeks! It all started so well, but then I got caught up in friends and family time and never got around to posting. Rest assured, I have continued with the ritual, albeit not blogging my efforts! For this reason, I have a special post planned for next week that should make up for the missed entries. Some hints as to the theme are that it will be spicy, sweet, savoury, refreshing and all about the outdoors! I hope you will come back to check it out! In the meantime, I am sharing with you a simple, but favourite vegetarian dish of mine. When I was a child I would always looked forward to this for two reasons: firstly because it contained paneer (Indian soft cheese), one of my favourite things to eat as a child and secondly it was always so colourful; you eat with your eyes first, right? My mother wouldn’t make this very often as my father prefered paneer in the bhurji style (crumbled and soft like scrambled egg) . In this dish the paneer in compressed into blocks, cubed and then fried- you can buy both the blocks and pieces- fried and unfried at both Indian and regular supermarkets all over the UK. If you buy the blocks, simply cube and deep or shallow fry until a gentle golden edge is achieved evenly. A home made version is tastier and softer, but a little time consuming. It all boils down to the milk (no pun intended :) ) I say this because in Canada, the store bought paneer is excellent and I am sure it’s down to the milk. I highly recommend the Canadian brand Guru Nanak if you have that in your area- saves a lot of time! In the following weeks I shall be dedicating a post to paneer with a recipe of how to make your own at home as it’s a useful ingredient to make for use in both sweet and savory recipes as well as a great way to use up excess milk! My mother would tend to make this dish when we had people over as it contains no real objectionable vegetable for the token fussy eater to dislike and so the chances are that it would be enjoyed by all. The other reason I have chosen to share this recipe is because it is extremely versatile meaning that you can substitute other vegetables that you have to hand. What makes this dish is the masala base. If you can master this, you can apply this to virtually any vegetable combination with minor adjustments and or additions. 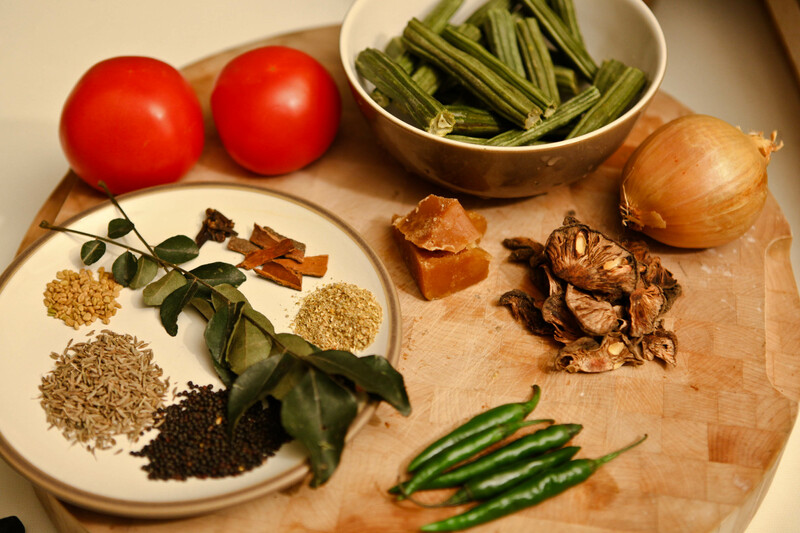 Each combination will taste different as the masala will enhance each vegetable’s natural flavour. This recipe is simple, quick and delicious. To prepare the base masala that you can use with almost all vegetables, heat a wide based pan with 3-4 tbsp oil to a moderately high heat. Add the cumin, and for this particular recipe also add the mustard seeds and whole fennel seeds and allow to splutter. You can use the mustard seeds with most vegetables also, but the fennel seeds tend to only marry well with certain combinations such as with aubergine, bitter gourd and okra- although for my taste, I wouldn’t put mustard seeds with either of the last two. There is no wrong or right, per se- you just need to experiment and find the flavour combinations that you enjoy. Next add the onions and green chilies and allow the onions to become slightly translucent. You do not need to caramelise them. About 5 mins. 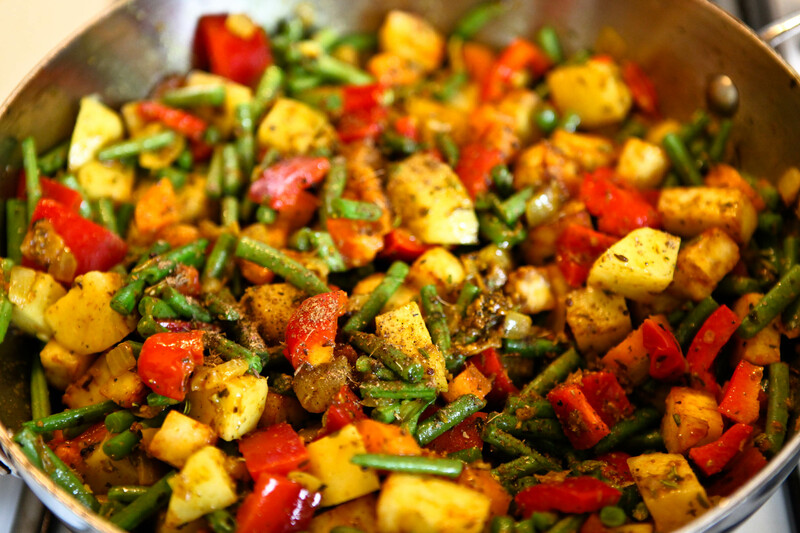 Now add all the vegetables and on high heat stir well to coat the vegetables with all the masala. Bring pan to a steaming heat and before putting on the lid to steam, sprinkle over the crushed fennel seeds and garam masala. 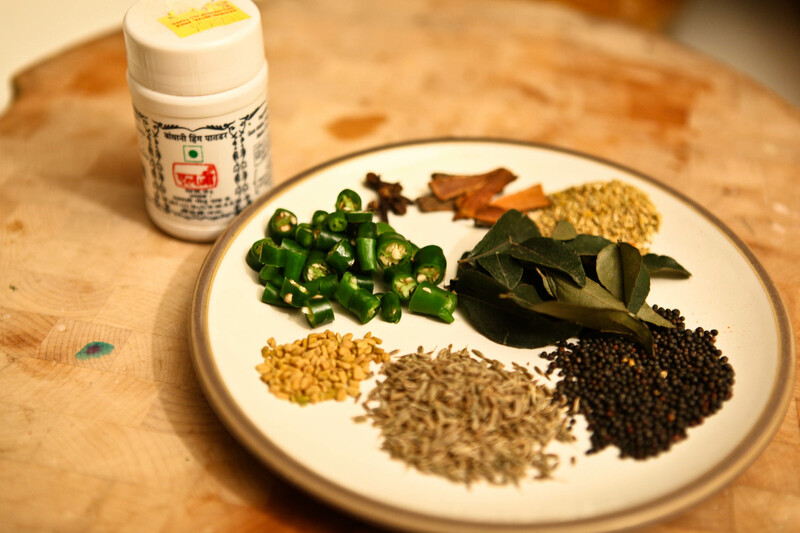 For other vegetable combinations I would just use the garam masala, but it is not an essential stage- it can be omitted. 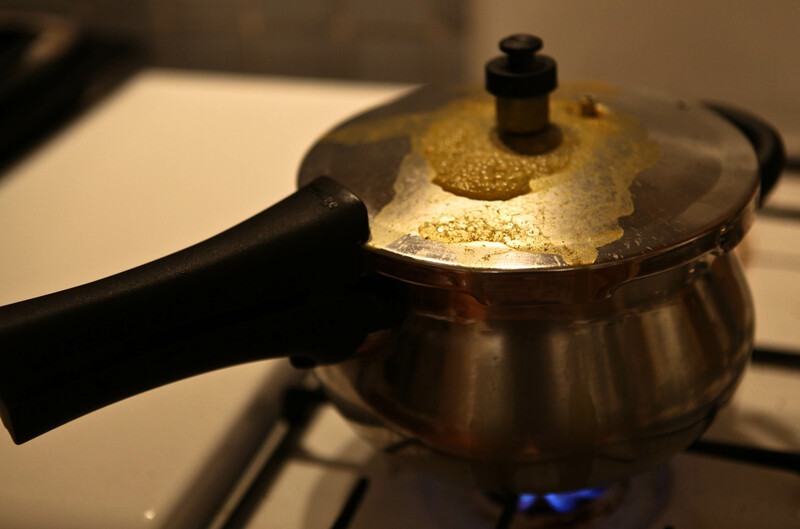 Put a lid on and put the heat right down to the lowest setting on a gas cooker. If you are using another kind of stove, bring the heat down to a 2-3 so that it’s just below a simmer. You want to gently steam the vegetables without them catching on the bottom of the pan and without adding water. The dish is ready when the vegetables are cooked- about 10-15 mins. Garnish with fresh coriander and a little sprinkling of crushed fennel seeds if you like. Serve with fresh naan or roti and yogurt. 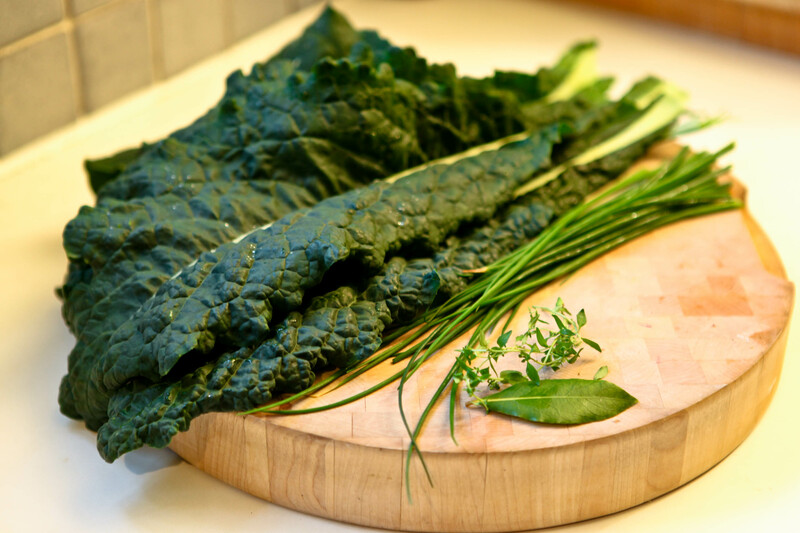 This makes a great main dish or vegetable accompaniment. Try it together with a dal for a complete vegetarian Indian meal.